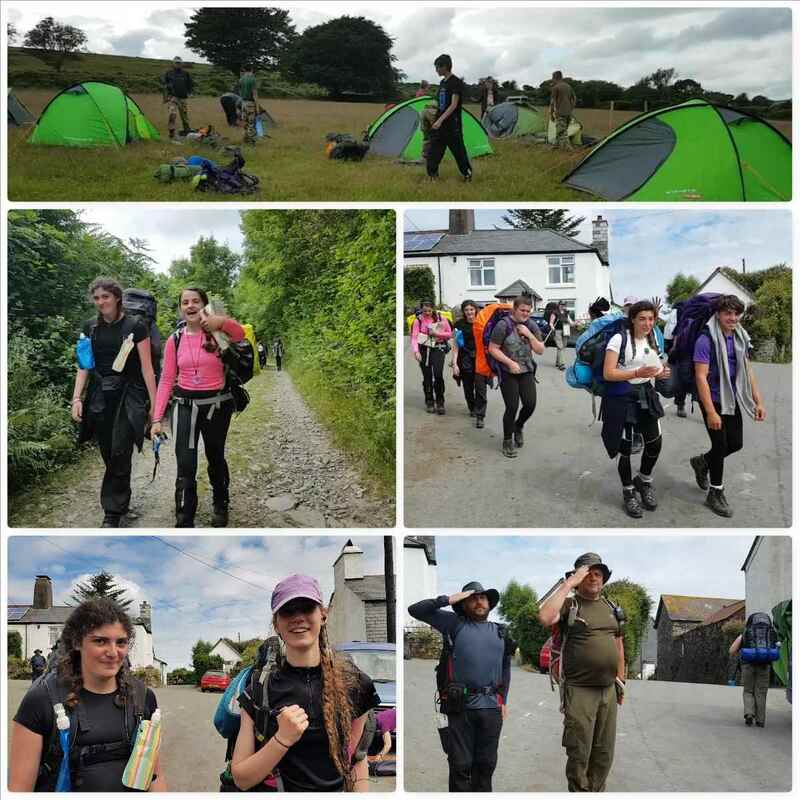 It was time to head back down to Dartmoor early in July with Sea Cadets from our London and Southern Areas to run a Gold DofE practice expedition and boy was it hot. 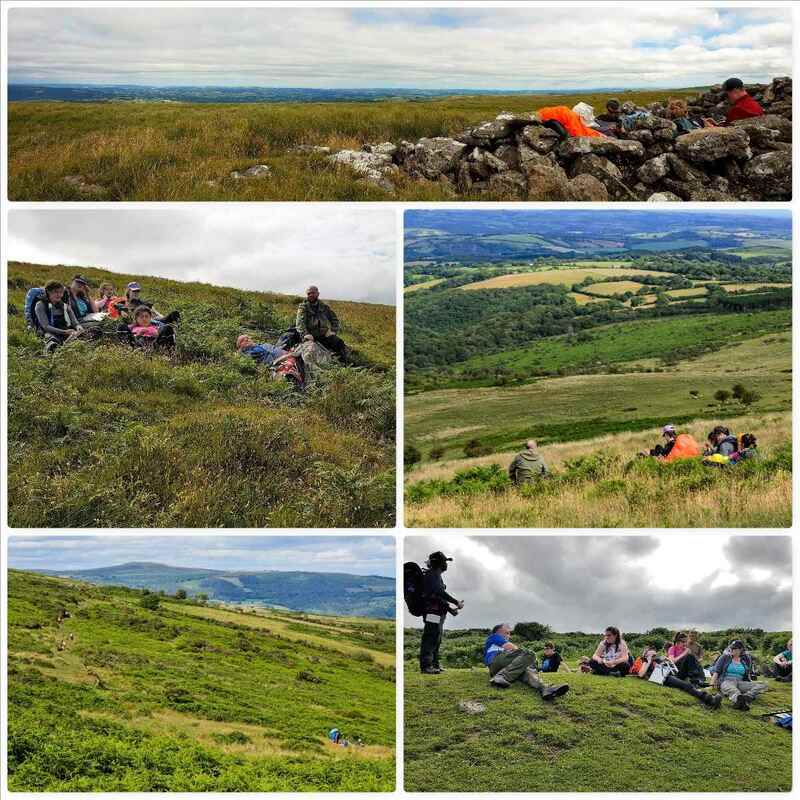 These training expeditions have one day of training on the Moor for the cadets and staff who are doing their Gold DofE followed by 3 days of remote supervision. We tend to stick very close to the groups on the first day of remote supervision and then as everyone gets their navigational eye in we tend to just meet up with them from time to time. 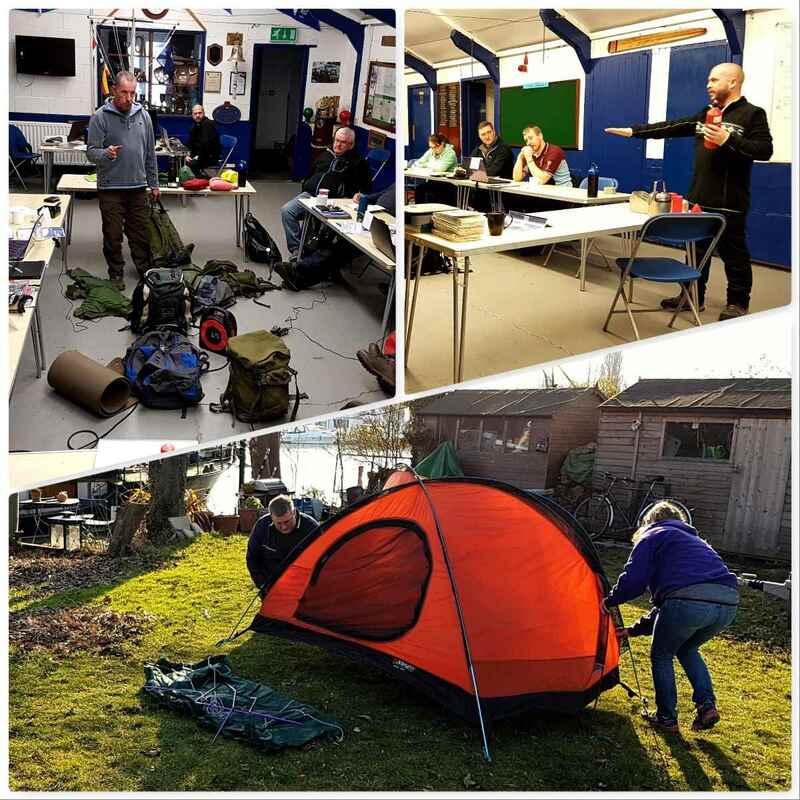 Early in the morning some of our trainee instructors (doing their Basic Expedition Leadership Award) ran some classes on kit to carry and map work. 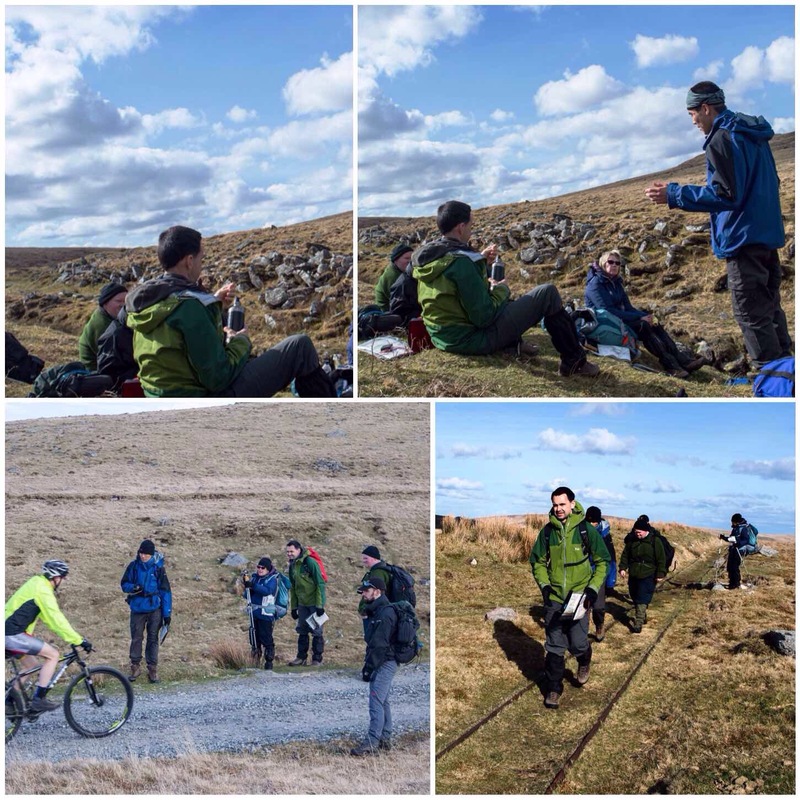 Around 11am we headed out to just south of Princetown to get in some navigational time on the Moors and we soon found the temperature starting to shoot up. Everyone was in light order for the training day with plenty of water and sun cream. You can see from the pictures below just how hot it was with all that blue sky (and for a Scotsman let me tell you it was not comfortable). 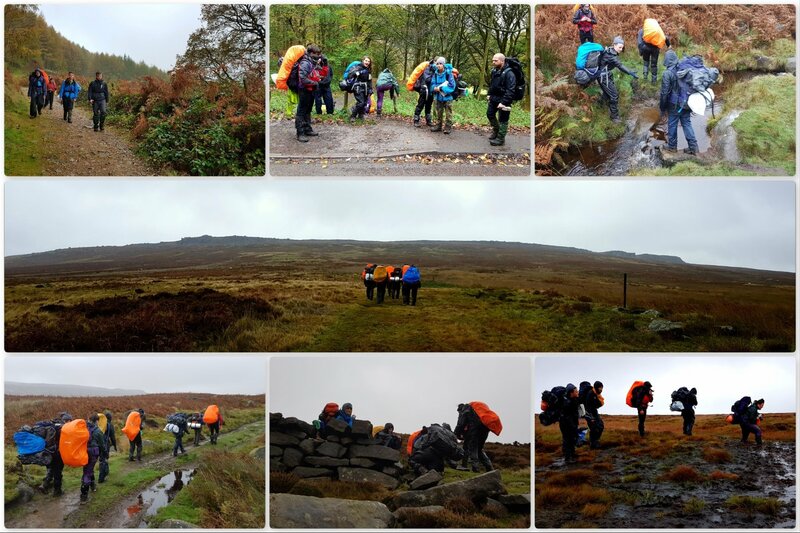 Each team had an instructor with them and were soon off onto the Moors testing out their navigational skills. There were plenty of adventures along the way and I spent time skulking in a Dartmoor Leat (a man-made stream) photographing and filming the wildlife (I will put up a separate blog on this sometime) and even caught sight of someone paddle boarding along one. 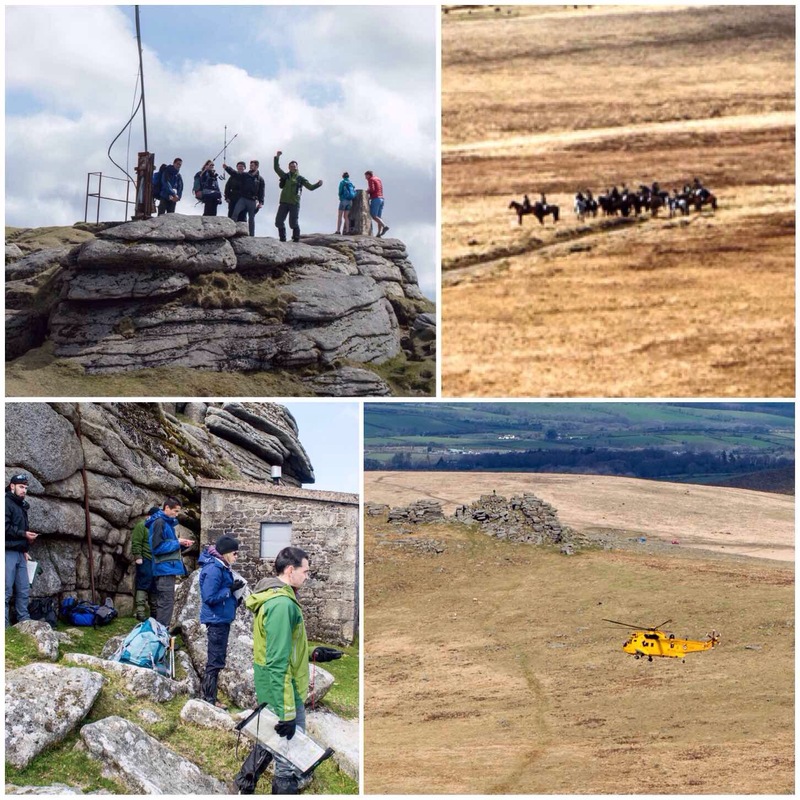 The next day the teams were let off on their own and we headed up onto the Tors to keep an eye on them. 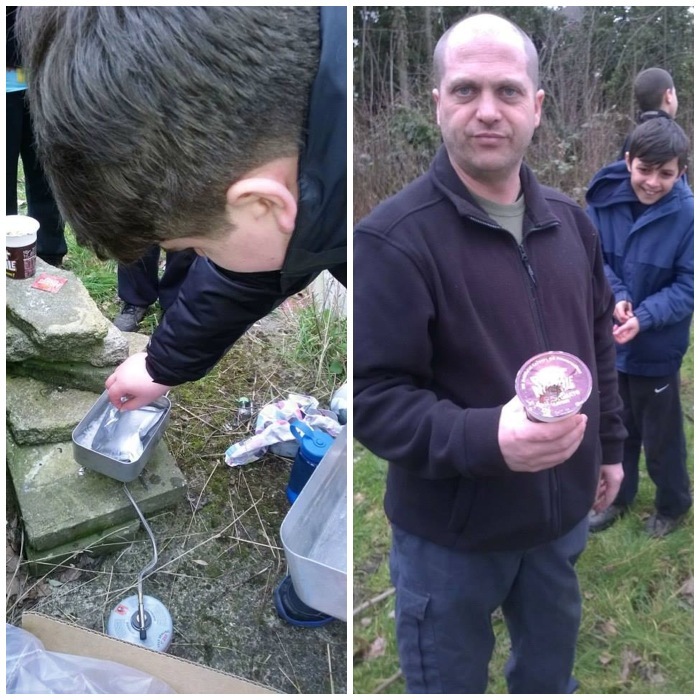 We had plenty of radios and one team even had a tracking device on them. 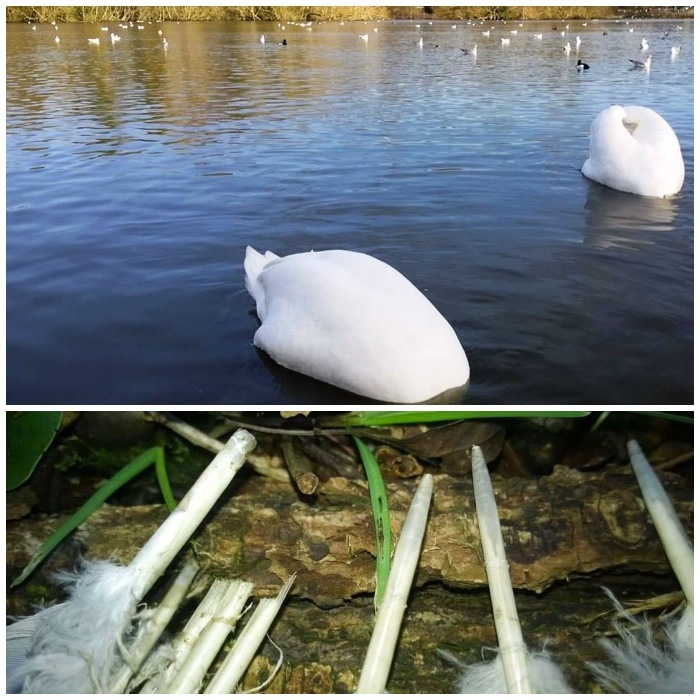 The visibility was clear and we soon saw them on the move. 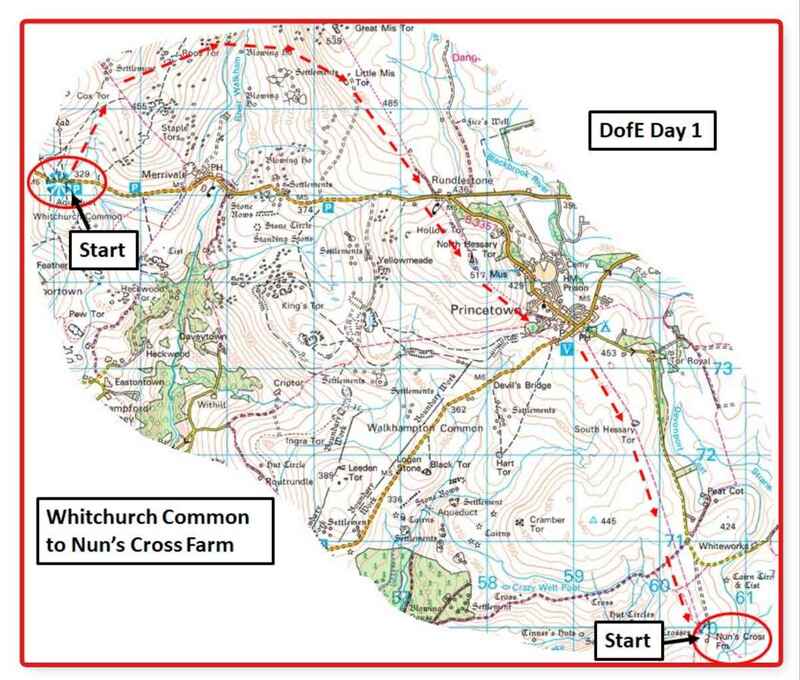 One team made good progress over the Tors but two took a slight detour and had to be shunted back on course. 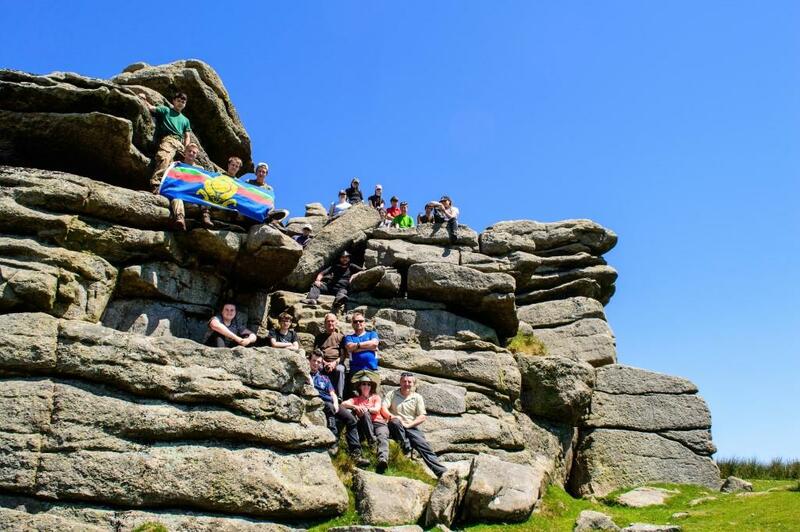 Luckily we had plenty of staff with us and everyone eventually made their way over the Tors. 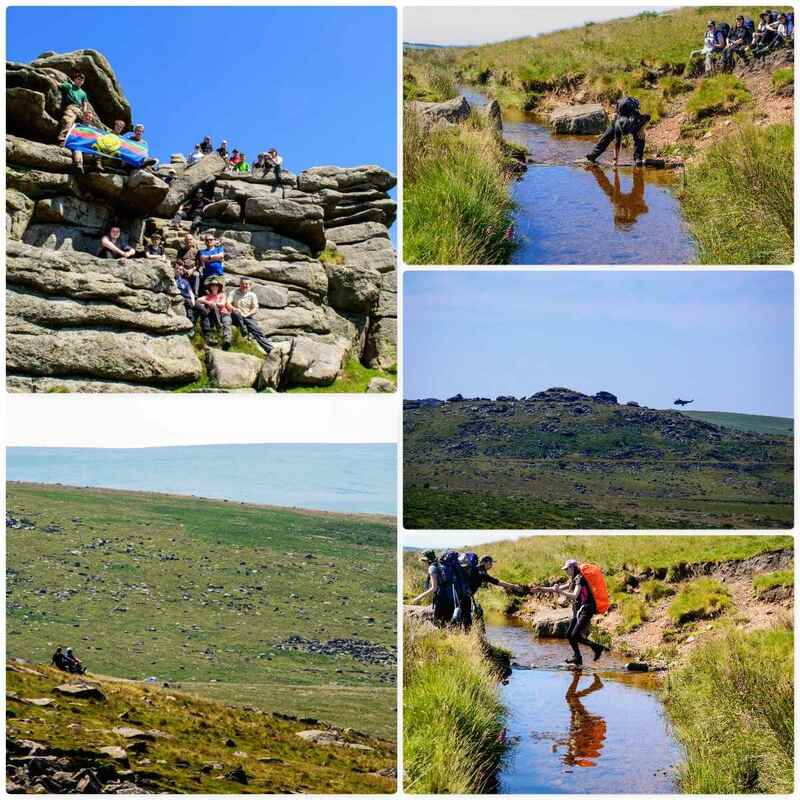 The temperature was soon rising again and we made sure everyone had water at each of the checkpoints (and an ice-cream in Princetown). As usual we stopped for a picture on one of the Tors (Little Mis Tor) and watched the helicopters playing about on the Moors. The Tors offered some respite from the heat of the sun with their lovely shaded north-facing nooks and crannies. 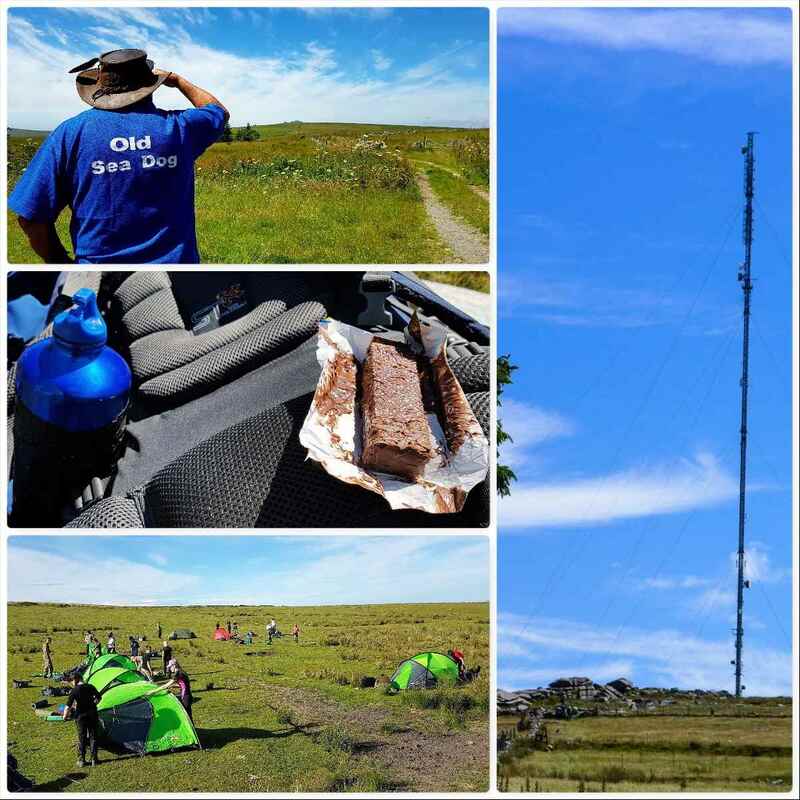 The teams were soon off up over North Hessary Tor (under the mast) and down into Princetown where we told them to get some ice-cream. 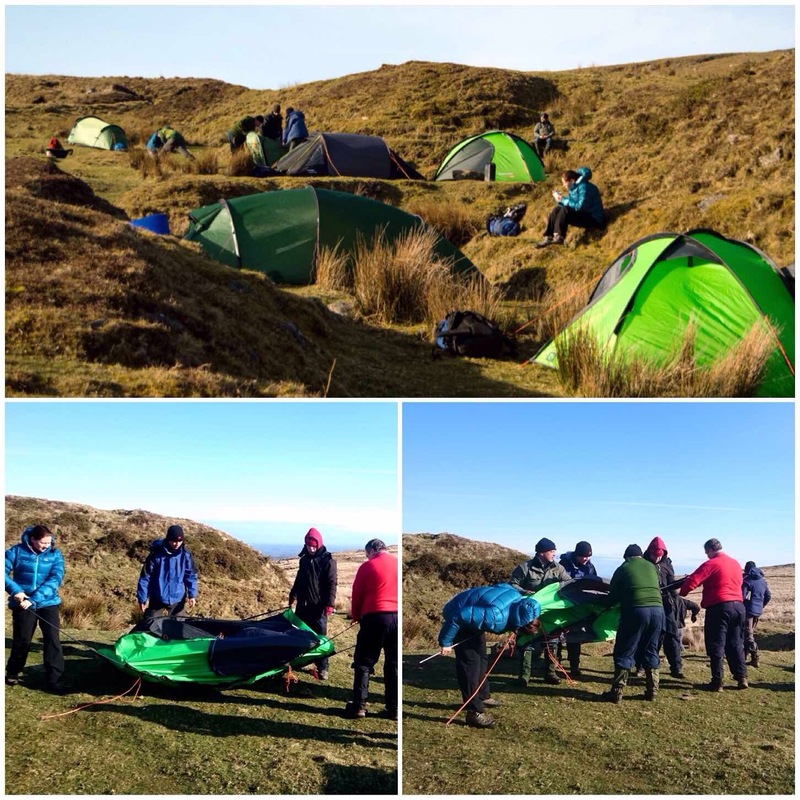 The campsite for the teams was south of Princetown at Nun’s Cross Farm. 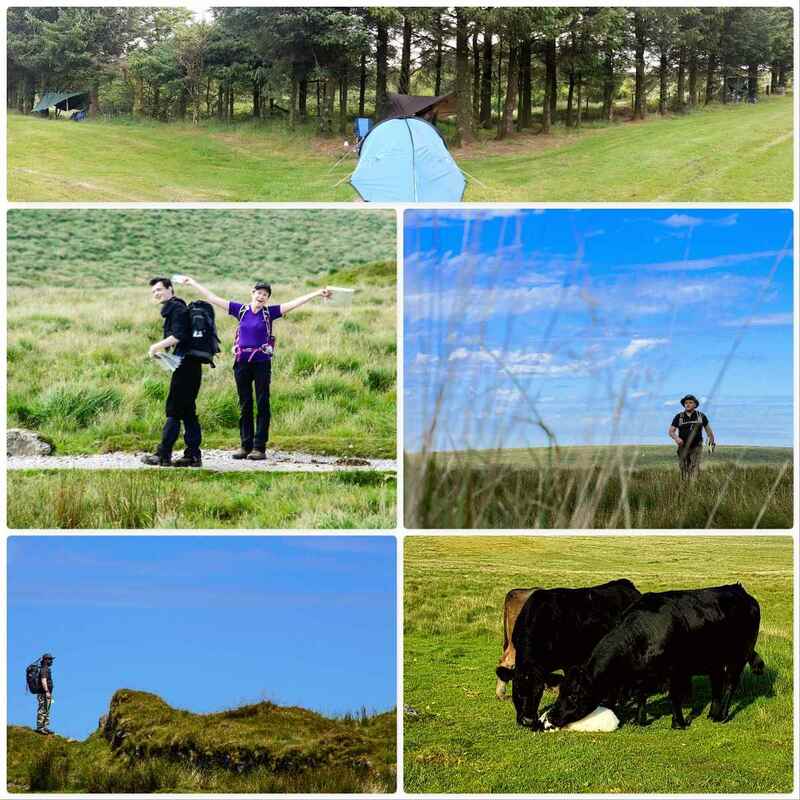 It is a fairly wild camp but with easy access for us with vehicles. On the way back to camp we spotted a fallen lamb being comforted by a herd of cows. It looked like the heat had really gotten to it so Chris, Carol and I gave her (I think it was female) some water to drink – she took nearly two water bottles. Chris also sprinkled water over her body to cool her down. We tried to get her to stand but she was too weak. In the end we got the local farmer to come out and take her in. What really surprised me about the whole scene was the care the cows were taking over the lamb. 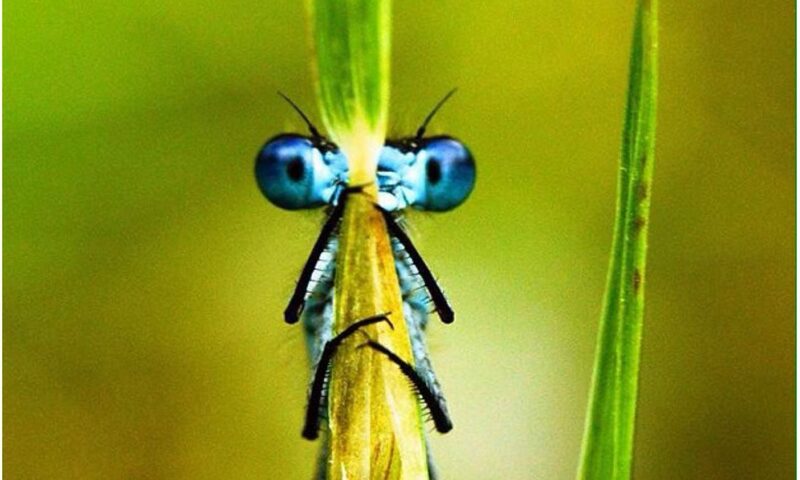 The were nudging her gently and standing over her to give her shade – quite something to witness. It was a great day all in all and I particularly liked spotting all the wildlife so I decided to put together a little video of that side of the expedition. 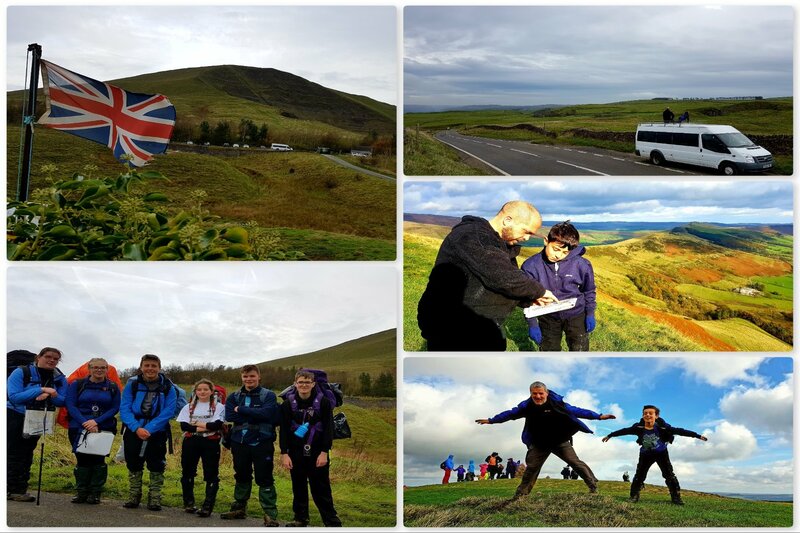 This part of the expedition was to prove the longest and the hardest. Due to the very high temperatures and because this was the practice expedition I decided to tell the teams to go in light order. 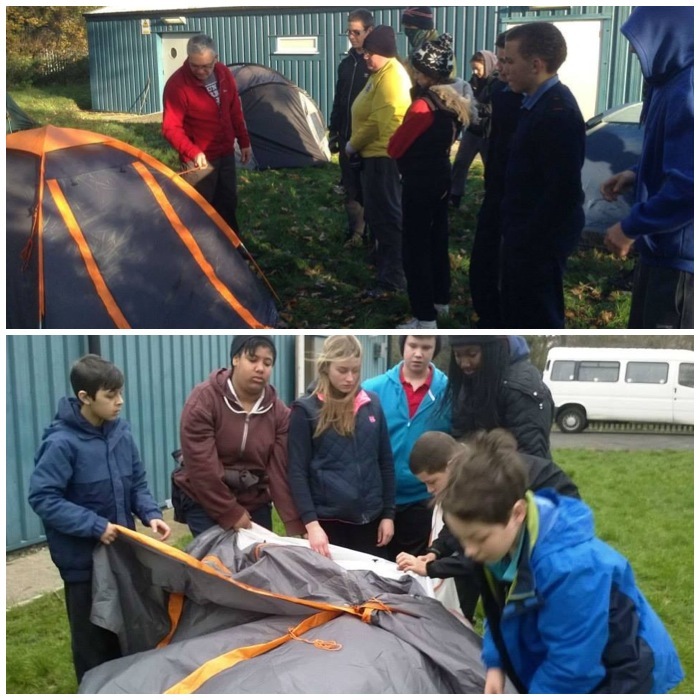 I took all non-essential kit such as tents and sleeping bags off them to lighten their load in the high temperatures. 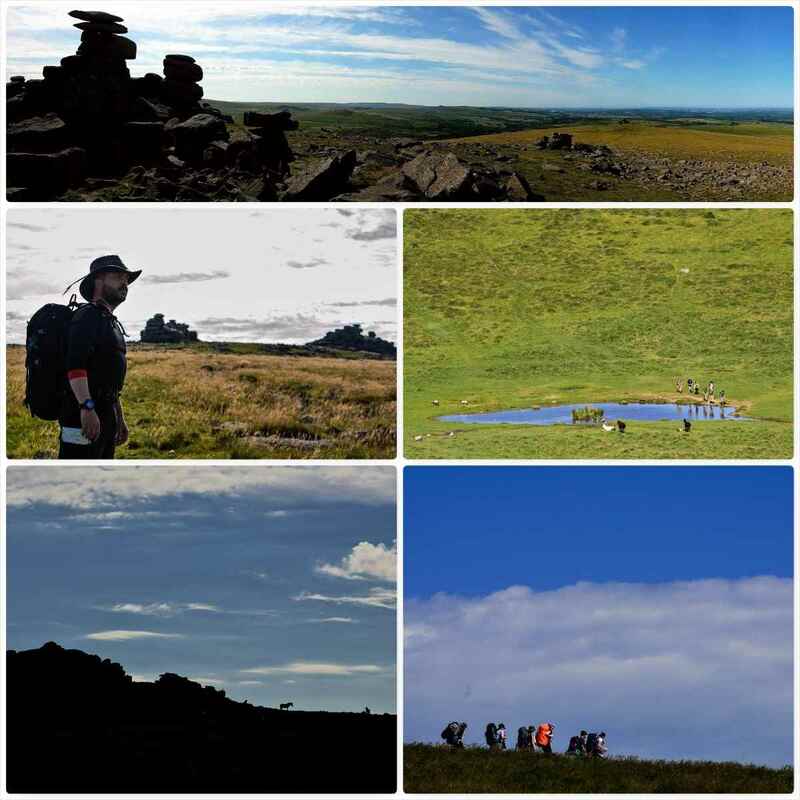 This part of the route took the teams over to the Eastern side of Dartmoor where the views are quite spectacular down onto the coast. 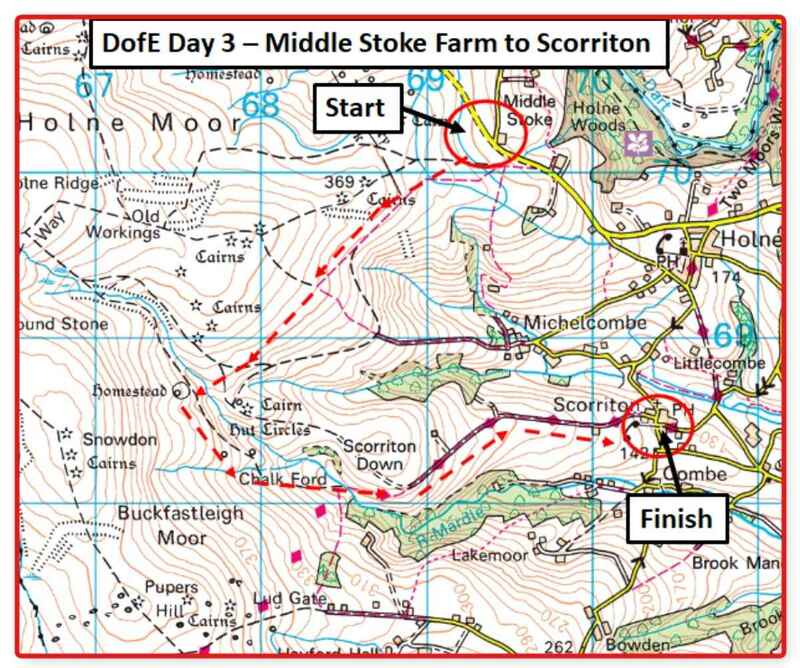 After a night in a farmer’s field at Middle Stoke Farm, the teams were up and away for their final day on the hills. 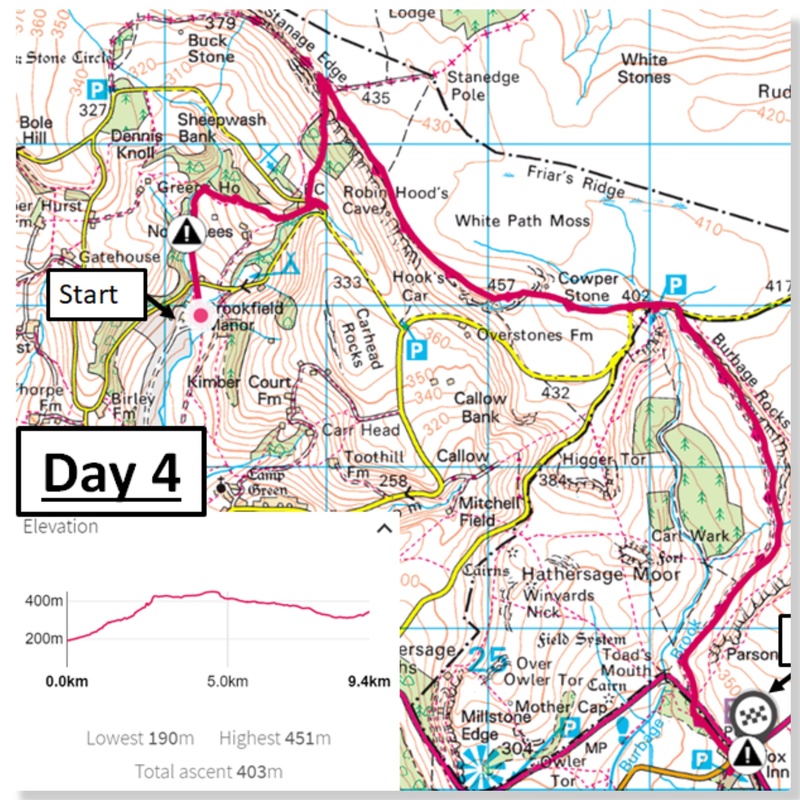 I had decided to stay off the hills that day as I had felt a torn muscle (from the year before) in my right leg starting to give way again. The teams headed off up into the hills and navigated along to a village called Scorriton. They had a tough time as all the paths had been little used recently and were quite overgrown (we had been there last year and they were clear) but they were soon coming down off the hills with smiles on their faces. 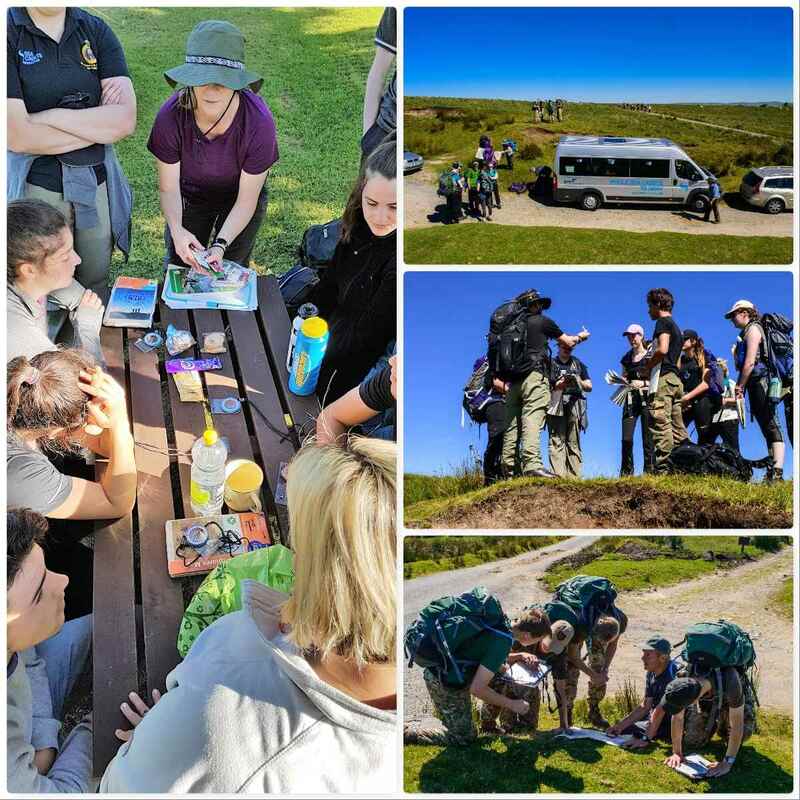 This was a easy expedition for me as there were so many great staff who gave their time up to come along (Boy do I feel old…… I realised that I had trained and assessed every one of them over the years) but it was a tough one for the cadets and staff doing the Gold DofE practice expedition due to the heat – well done the lot of you. A final video of the trip – one that I am very proud of – both in terms of what was achieved and its composition. 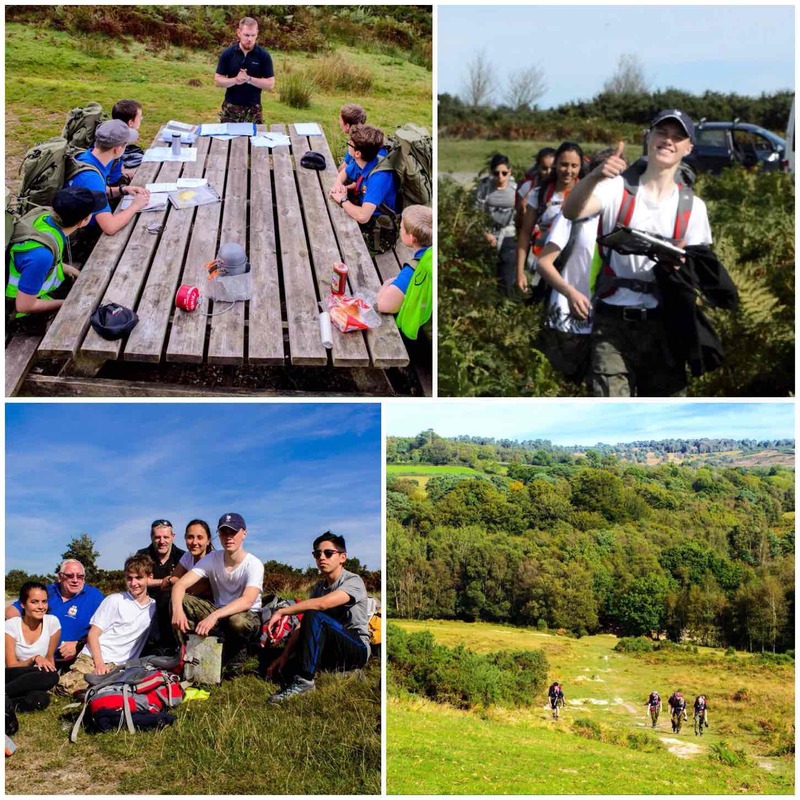 This year we were joined by Roy Sellstrom from Southern Area Sea Cadets as he is looking to start the course in his area. 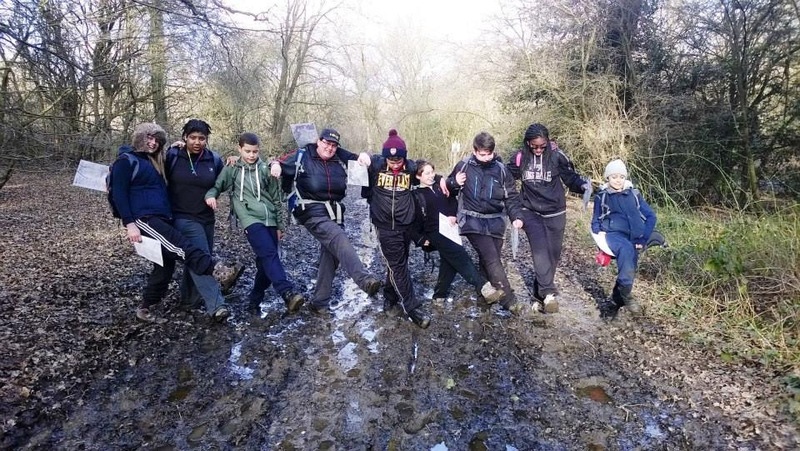 The award is nationally recognised and the success of London Area has started to be noticed now by other Sea Cadet areas. 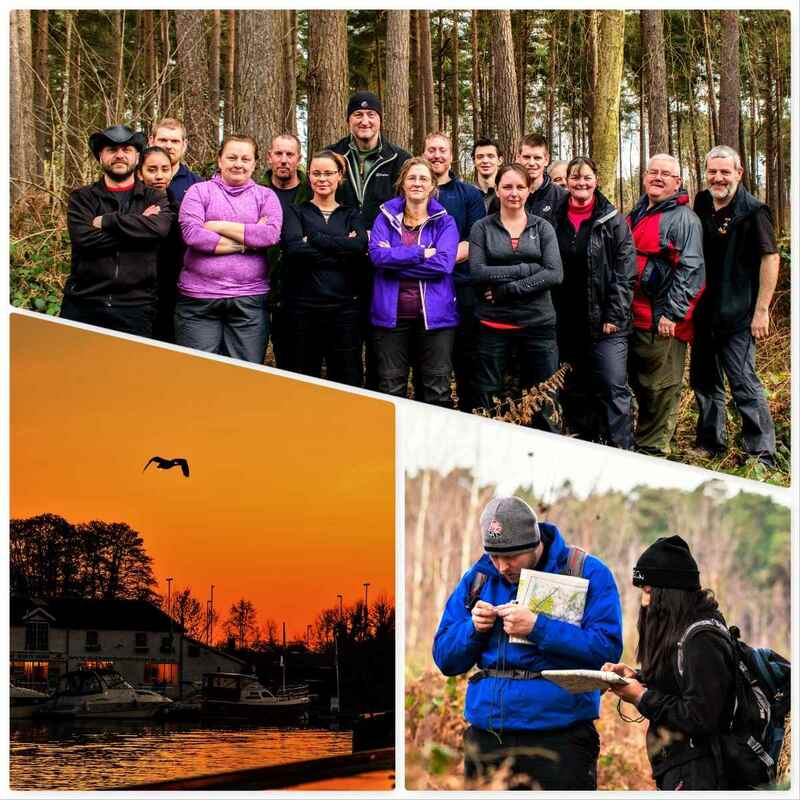 As the course is designed to be undertaken by students with very little adventure training experience we cover all the basics that a good leader should know. 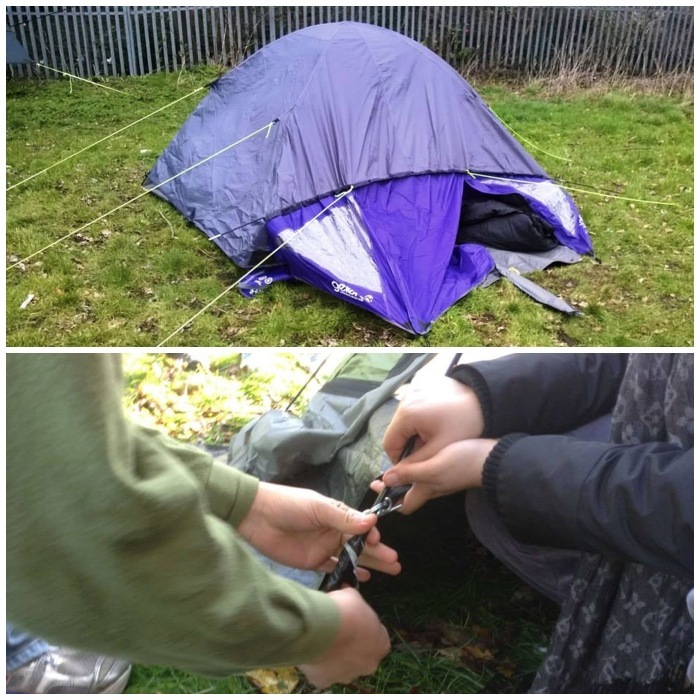 These included classes on clothing, rucksacks, leaders kit, stoves, the law and tents to name just a few we covered. 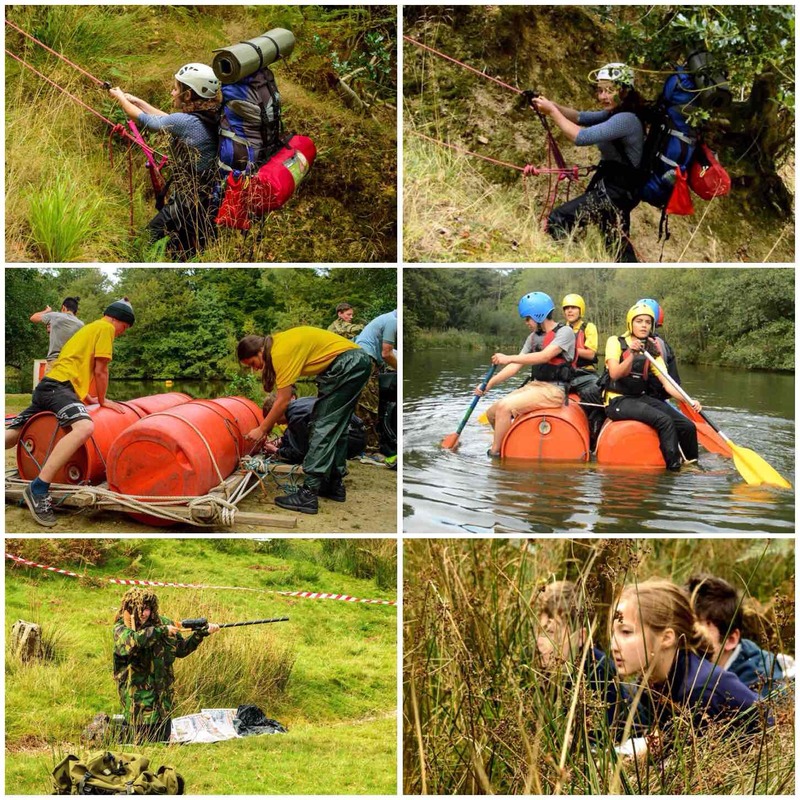 Our group contained a mixed bunch in terms of experience with quite a few who have been Adventure Leaders under the old Sea Cadet qualification system and are now looking to get this nationally accredited BEL award. This helps us as instructors as we can buddy the students up to share knowledge with each other. 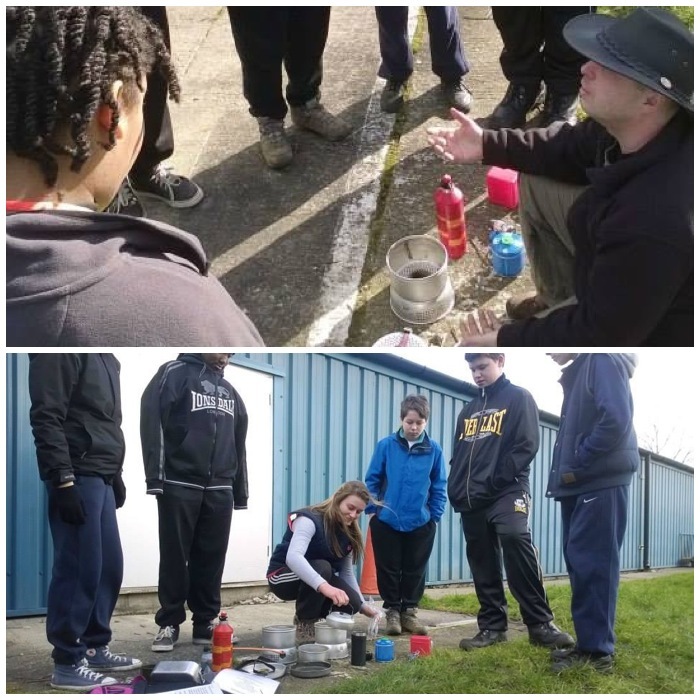 The first weekend is always undertaken at a Sea Cadet unit (this year once again at TS Black Swan) so that those students who are not so experienced can be introduced to the subject in a more controlled manner. 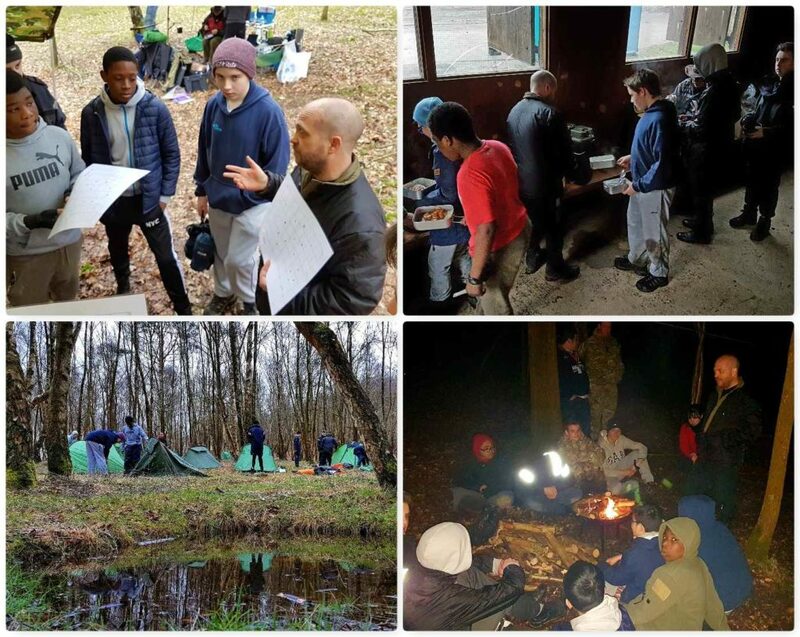 As the weekends go on they will be operating out of campsites in different parts of the country and passing on their new found skills to cadets as we observe them. 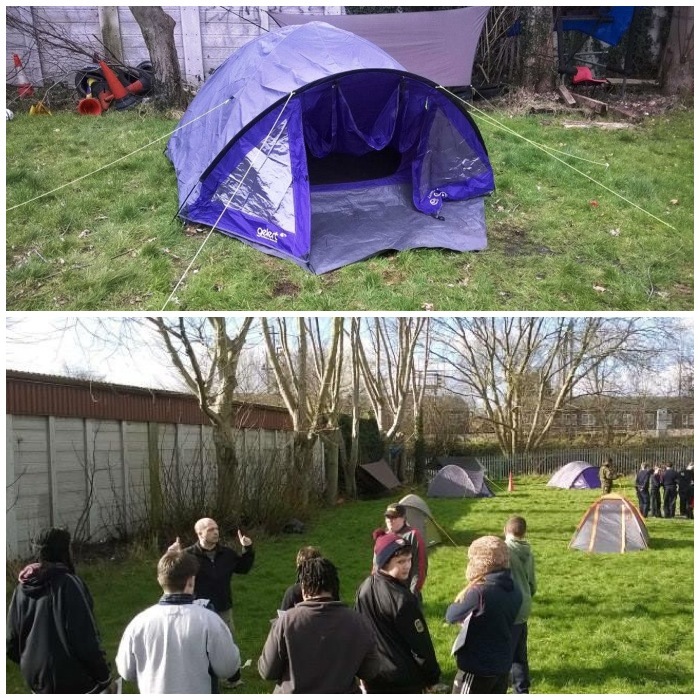 Not all the classes are indoors and we get outside for subjects such as looking at tent and stove designs. 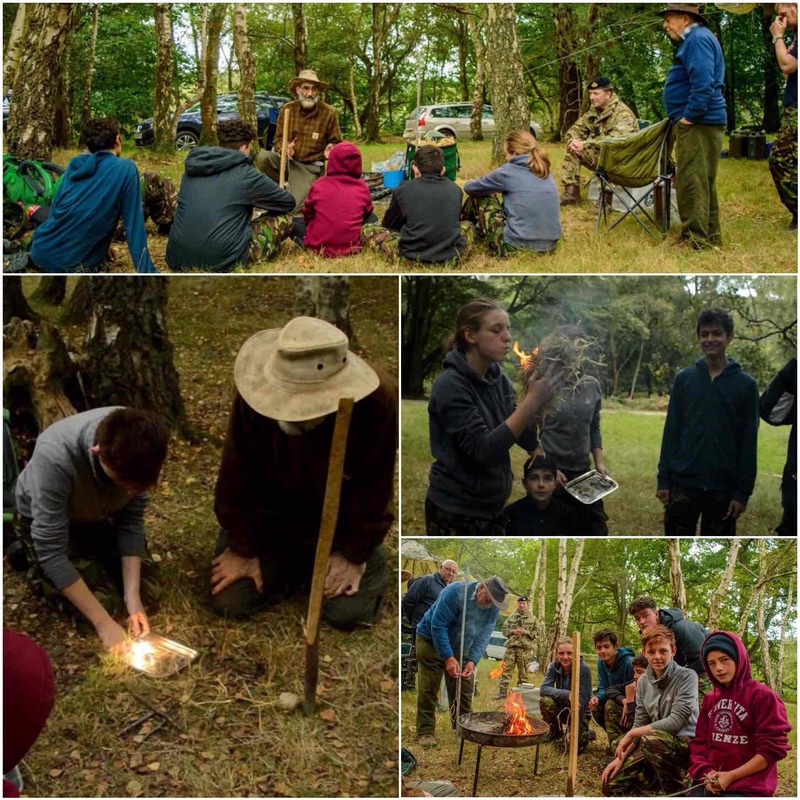 These are very hands on classes designed to let the students have time to get to know some of types of kit cadets will bring along to camps. 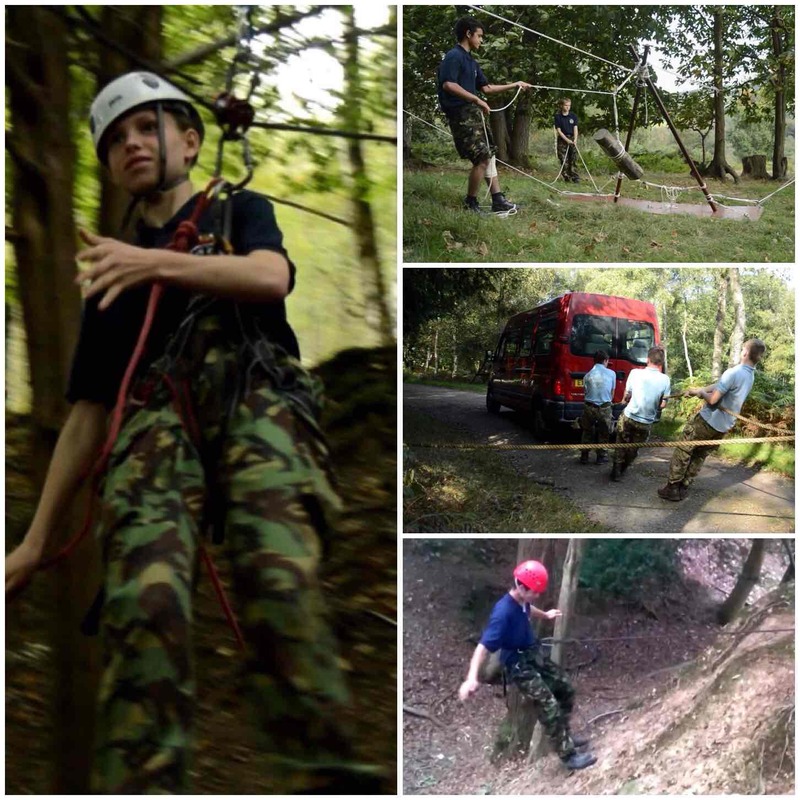 Life would be easy if we could issue our cadets with all the same kit but as we are a charity each unit must source their own kit so it all comes in different shapes and sizes. One of the reasons I love running this weekend out of TS Black Swan is the great food we always get. 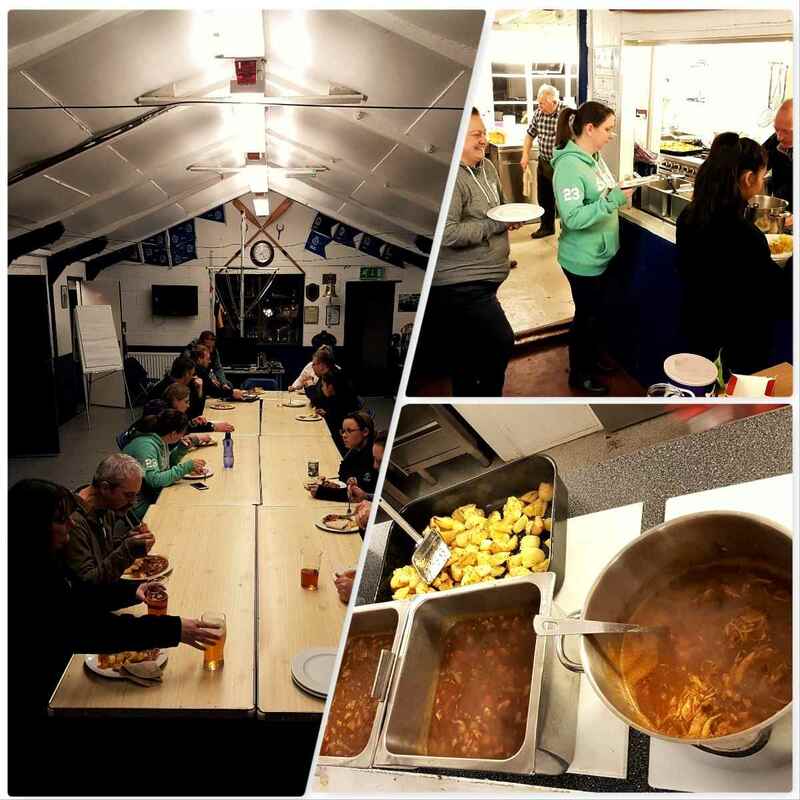 The galley staff are always there to feed us from breakfast time to supper time and this is really appreciated by everyone as it lets us get on with all the classes we need to cram into this course. No course run out of TS Black Swan would be complete without a little bit of relaxation time in the wardroom in the evening :-). Also the fact that the unit is in Sunbury on the Thames helps with the great views as you walk out of the door. 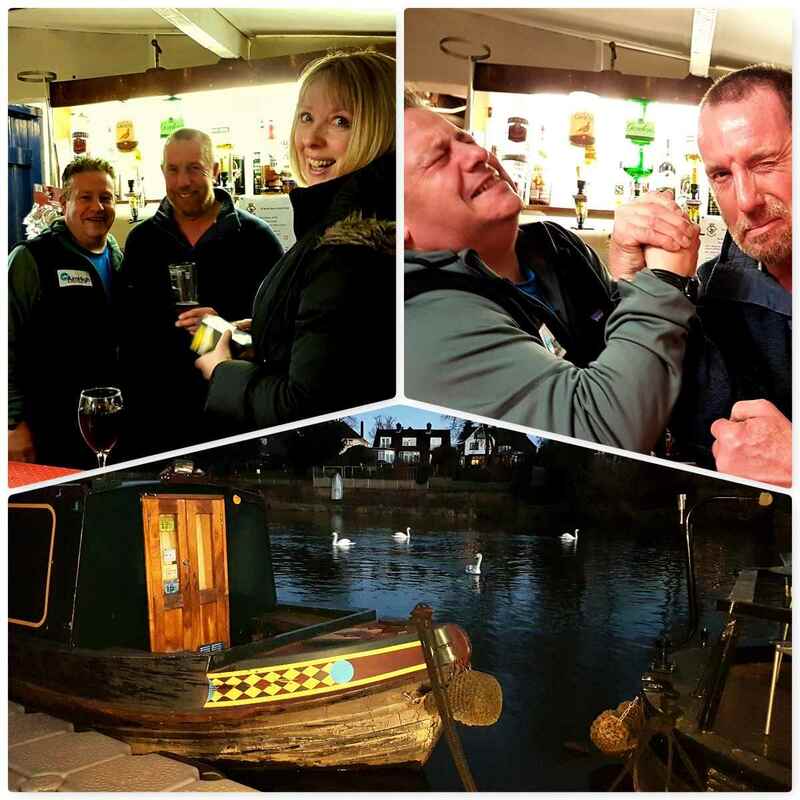 Normally I get to spend my evenings on my friend Paul’s canal boat but this year it was booked out with his new lady friend 🙁 Sort it out for next year would you Paul – I miss my bunk). 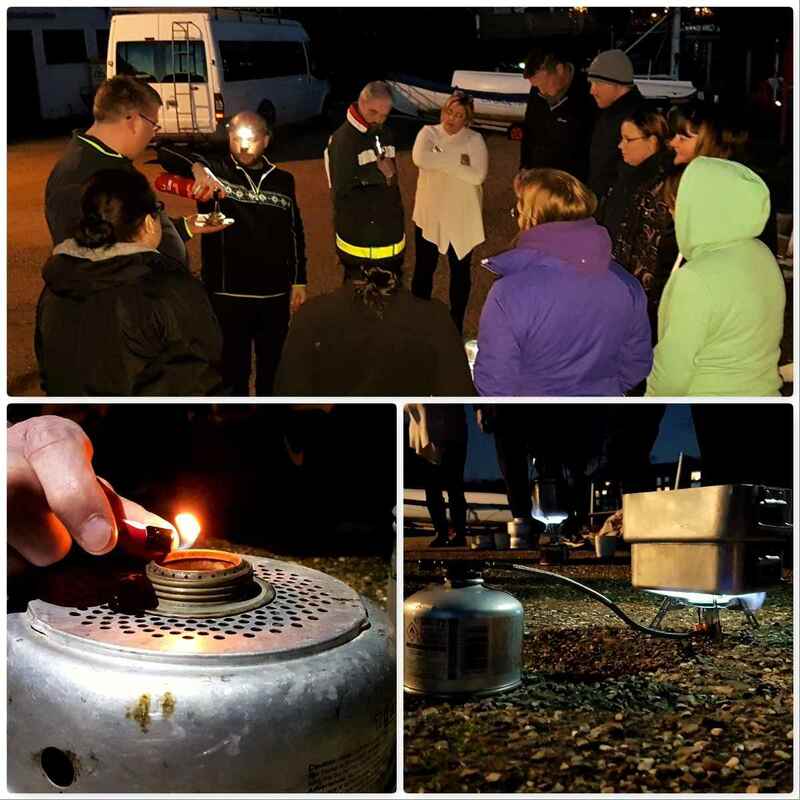 While we were running our classes there was plenty of other things going on at the unit including a Seamanship class and a Power Boat class. I spent my breaks sitting by the Thames seeing what was happening and hoping for the odd decent picture. 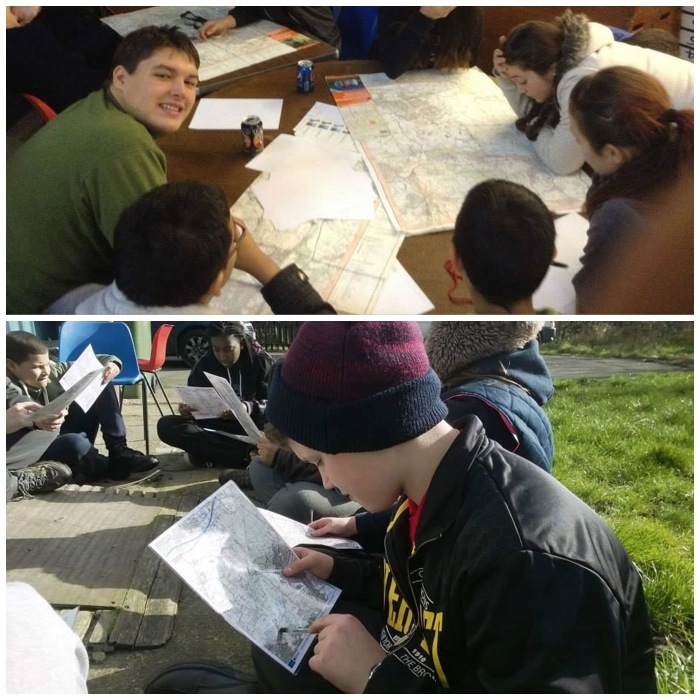 Sunday morning was all about map and compass work. 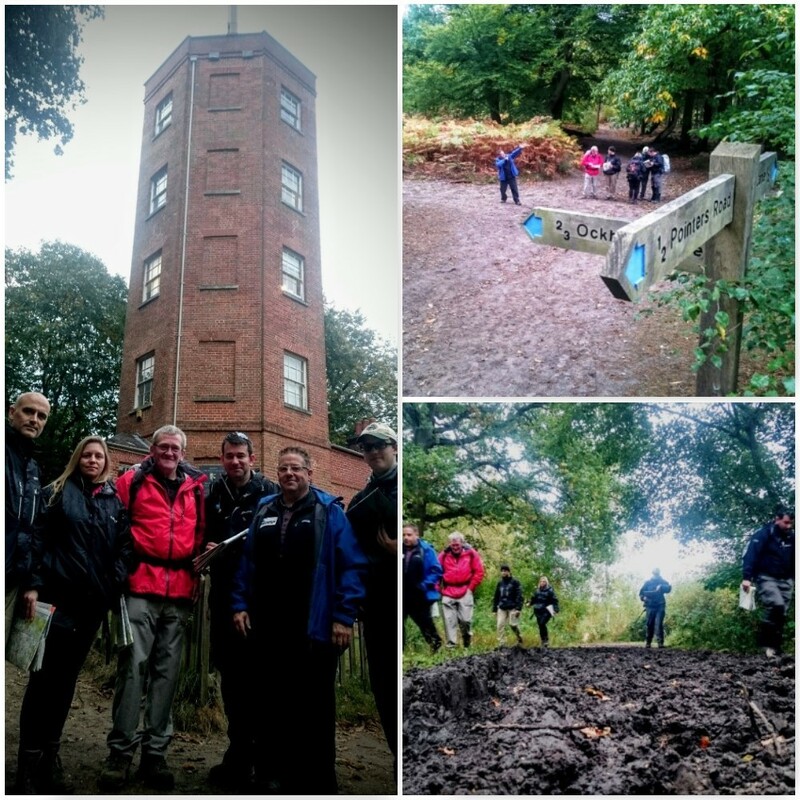 After a couple of classes by Roy and John on compasses and maps we were all off out onto the North Downs to practice our navigation. We broke the teams up into small groups as we had plenty of instructional staff and really concentrated on giving the students some quality tuition. A massive weighting in the assessment is on navigation so this is a skill we practice and test on every training weekend. 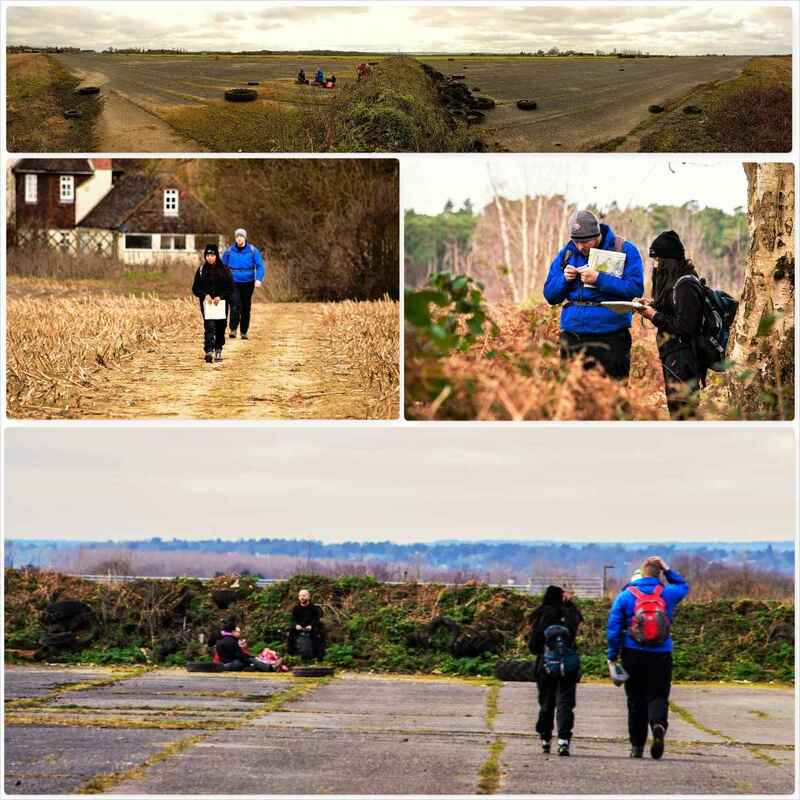 One minute the students would be in the woods trying to figure out the paths, then out in the open gauging distance, then to find themselves trying to figure out the best way to get a group across a busy road. 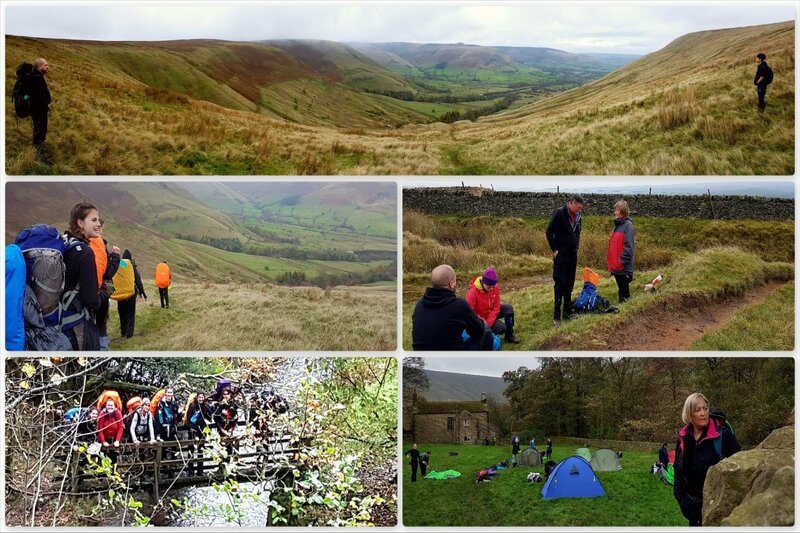 In between all this we had plenty of breaks to sit down and discuss all these skills and to just appreciate the countryside around us. 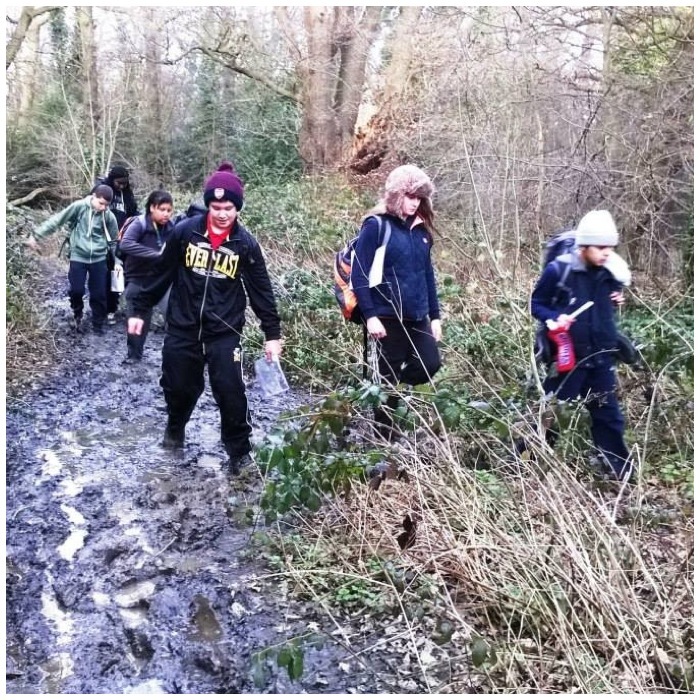 Back in the woods we started to meet up with the other groups as we took them of the paths and got them to work out their route using signs from the land around them. We get very attached to paths and I am a firm believer in getting off the path every now and then and adventuring about. 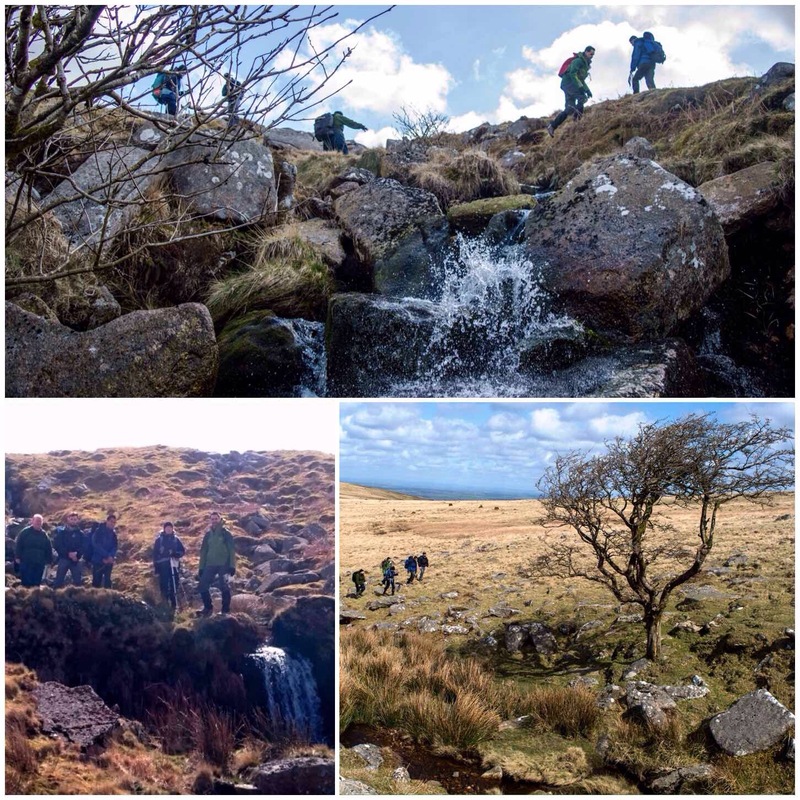 There are plenty more trips on this course ahead including Dartmoor, Ashdown Forest and the New Forest before the assessment at the end of the year. The London Area Sea Cadets annual Chosin Cup competition is one event I look forward to every year. 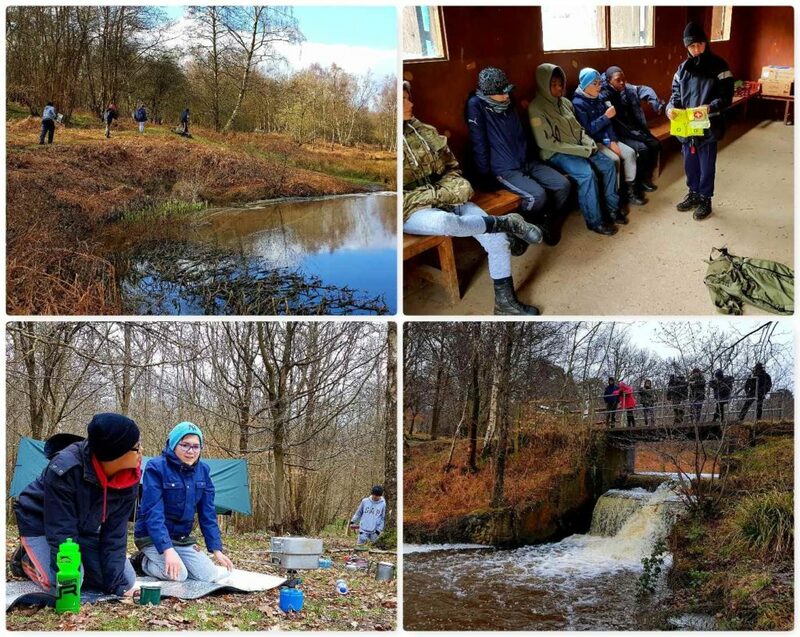 Since 1999 I have been attending this event and this year may not have been the hardest in terms of the weather but it sure was hard due to the sheer number of different tests the cadets had to undertake. 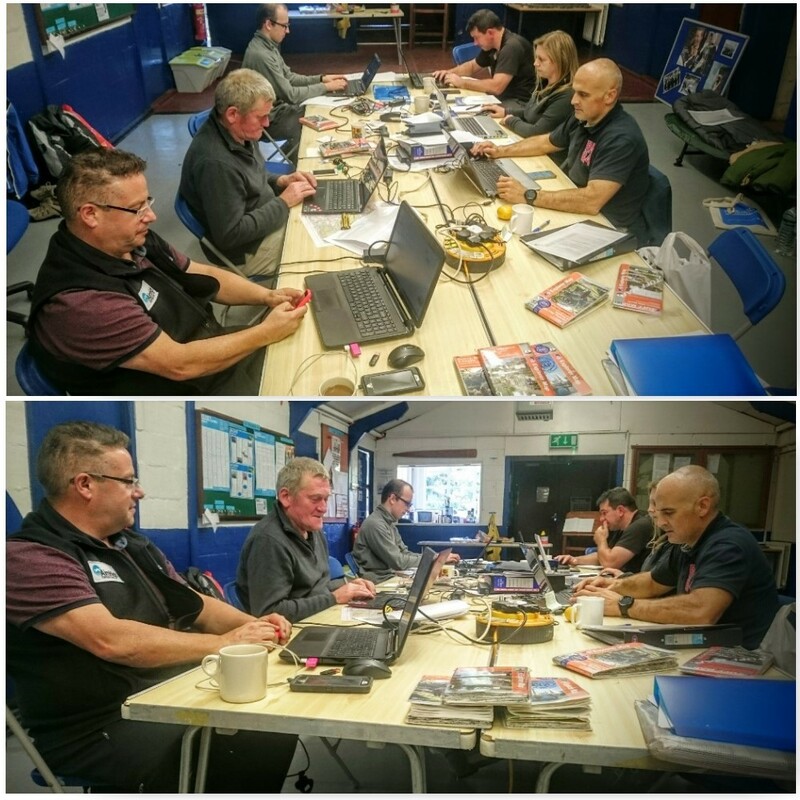 Kick off is on the Friday night (late September) with the cadets marching in to their bivvie sites and working on their route cards. The staff though were up into the early hours prepping everything for the weekend. First thing on Saturday morning they were briefed in their teams and then they were off. 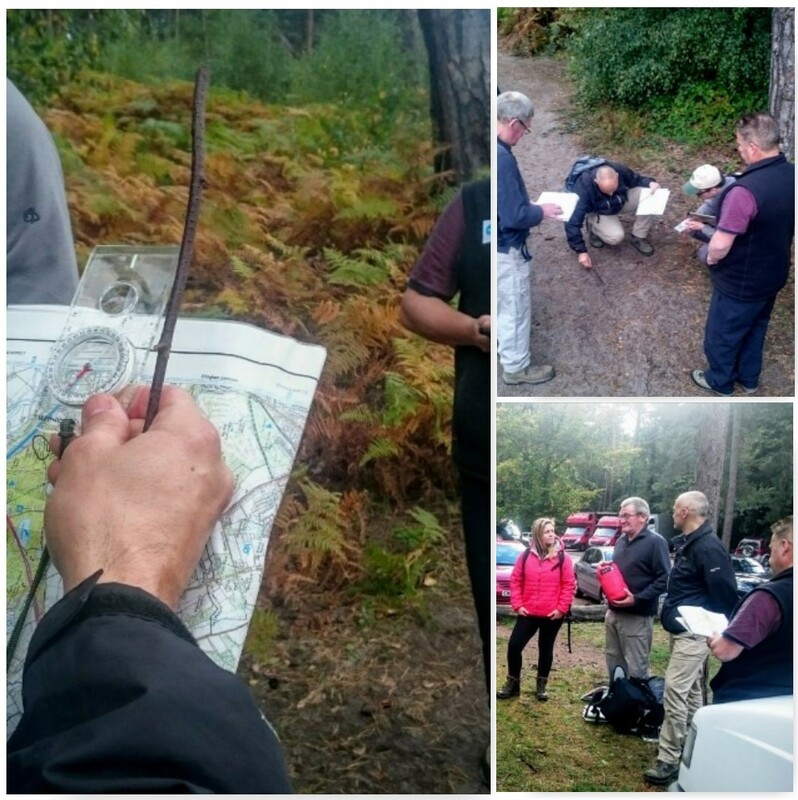 They needed to navigate a route inside and outside Pippingford Park military training area (located in the beautiful Ashdown Forest in the UK). 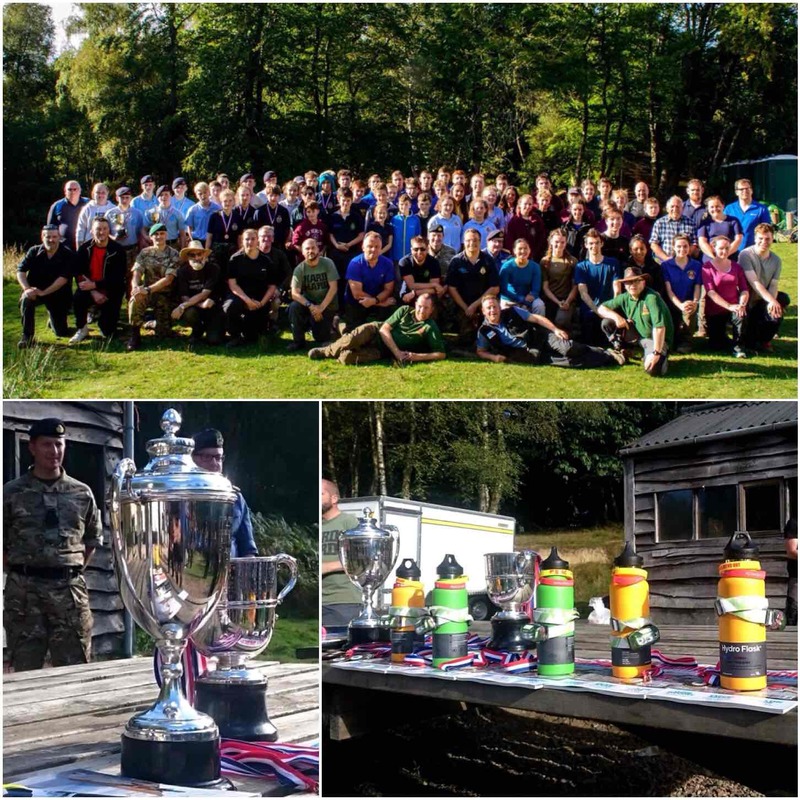 This year the Chosin Cup was run by our ‘soon to be‘ new Area Staff Officer Ben MacDonald. 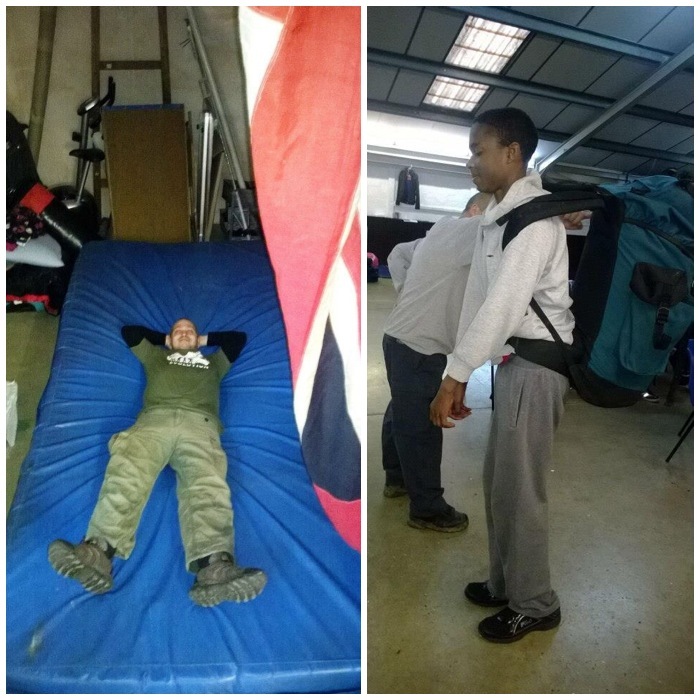 Ben is keen to really test the cadets and brought in some new activities for them to try out. 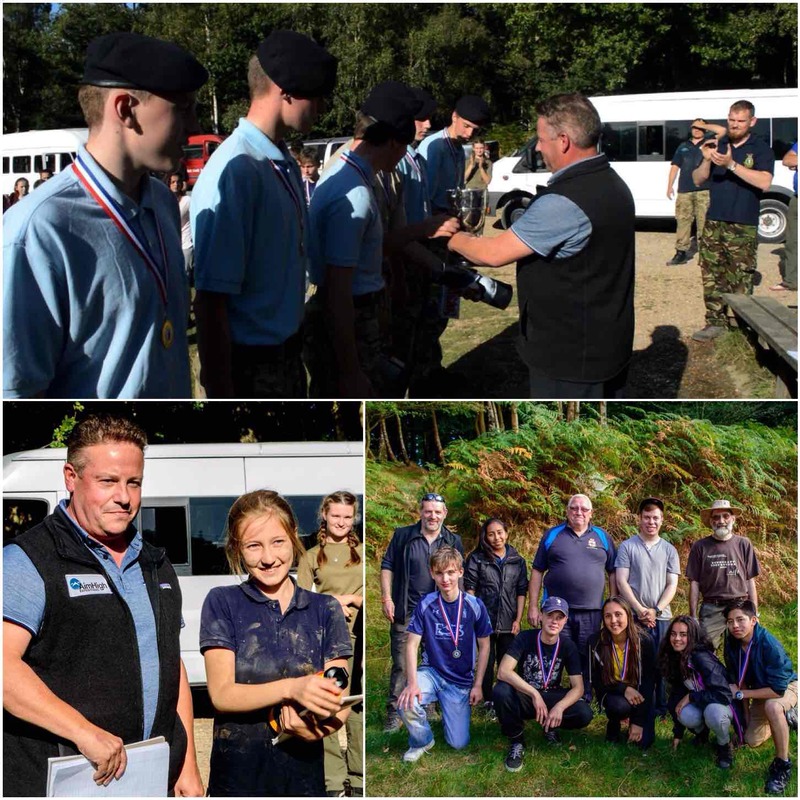 Cliff Lewis was in his element running the timed rowing race, there was plenty of archery to test the keen eyed ones, loads of fake blood for the hardy at heart to stem and a fantastic climbing tower to let the cadets scurry up. In between each stance the cadets had to keep navigating and pushing themselves to get to each one as quickly as possible. 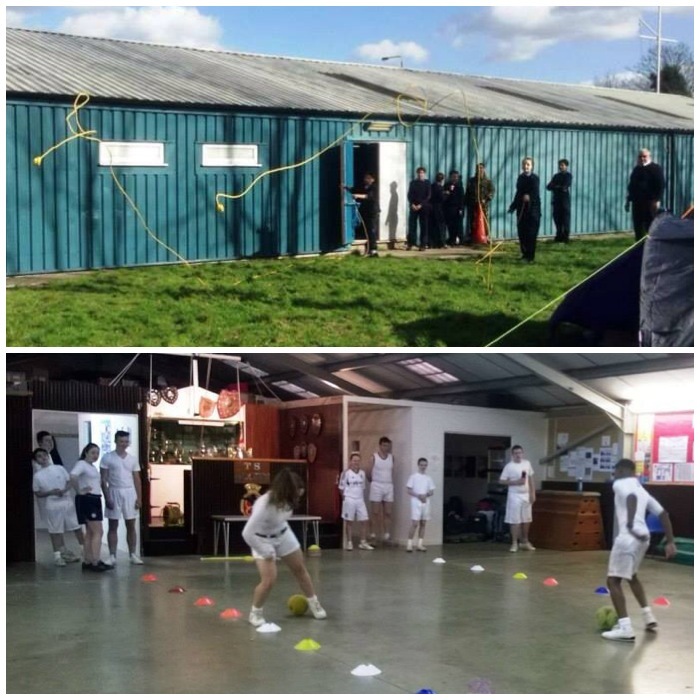 In between all this tooing and frowing of cadets the staff were busy running the stances (well some got a bit of R&R in between) and we had a visit on the Sunday from the Senior London Area officers (that kept us on our toes). As for myself I was in the enviable position of being the roving safety officer/official photographer (my car ended up totally covered in dust from all the dirt tracks). I put together a couple of short videos of the weekend and below is the first one with snippets of the Saturdays activities. The Saturday night was not a quiet affair, as soon as it was dark, they were off again. 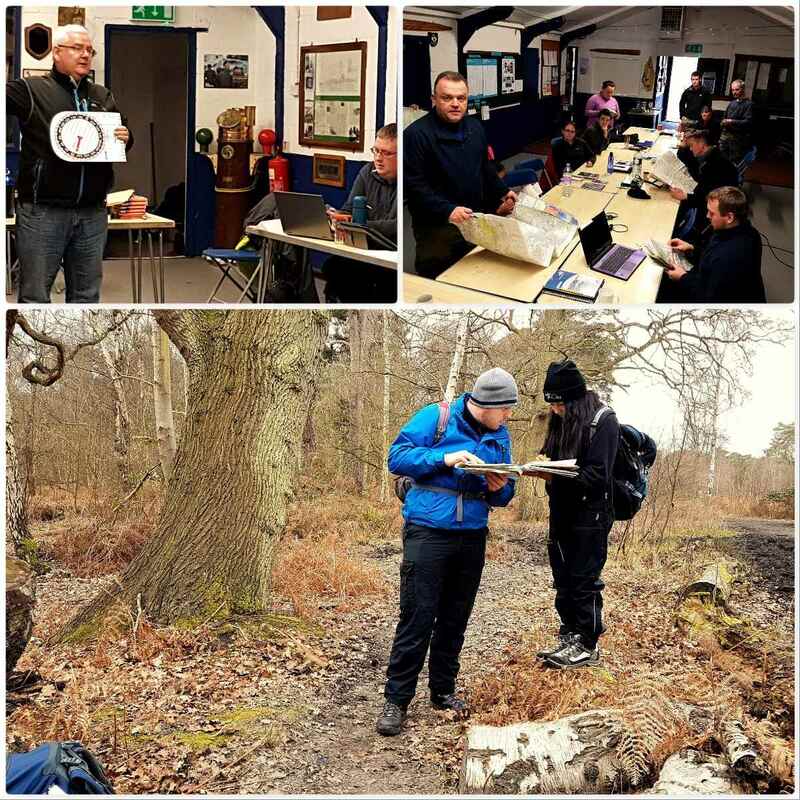 This time on a night navigation excercise working from point to point using compasses and maps – they all made it and were soon safely back at camp. 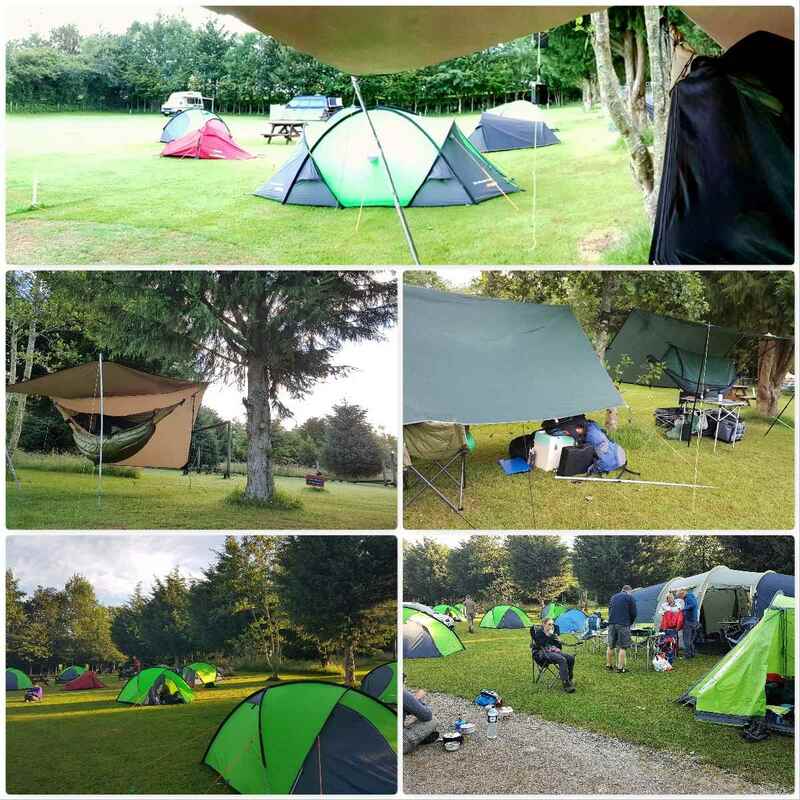 All the activities on the Sunday morning were located within the confines of Pippingford Park (no hardship there as it is a beautiful site) and so after a good breakfast it was time to get started again. My friend Charlie Brookes ran the Fire Race. 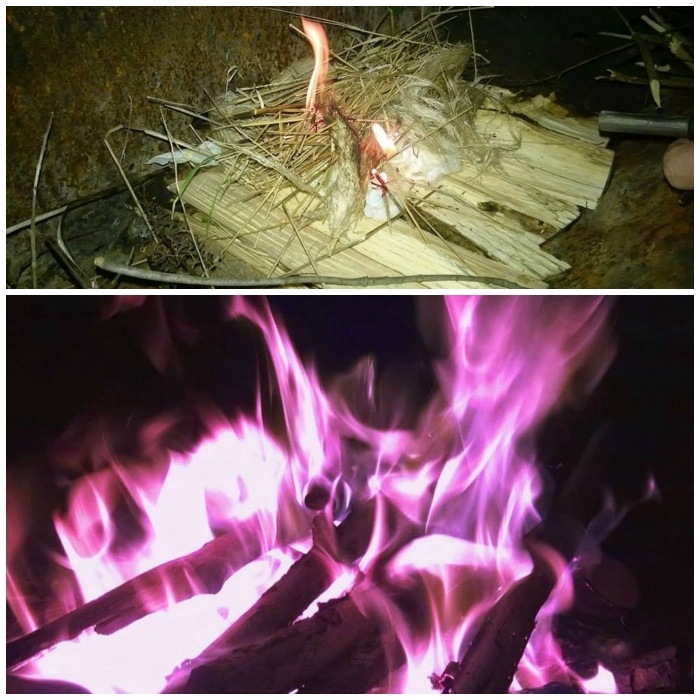 This involves collecting different tinders and twigs then lighting them (using a firesteel) and getting the flames high enough to burn through a suspended horizontal rope – not as easy as you might think. The event culminated in each team having to run the Endurance Race. 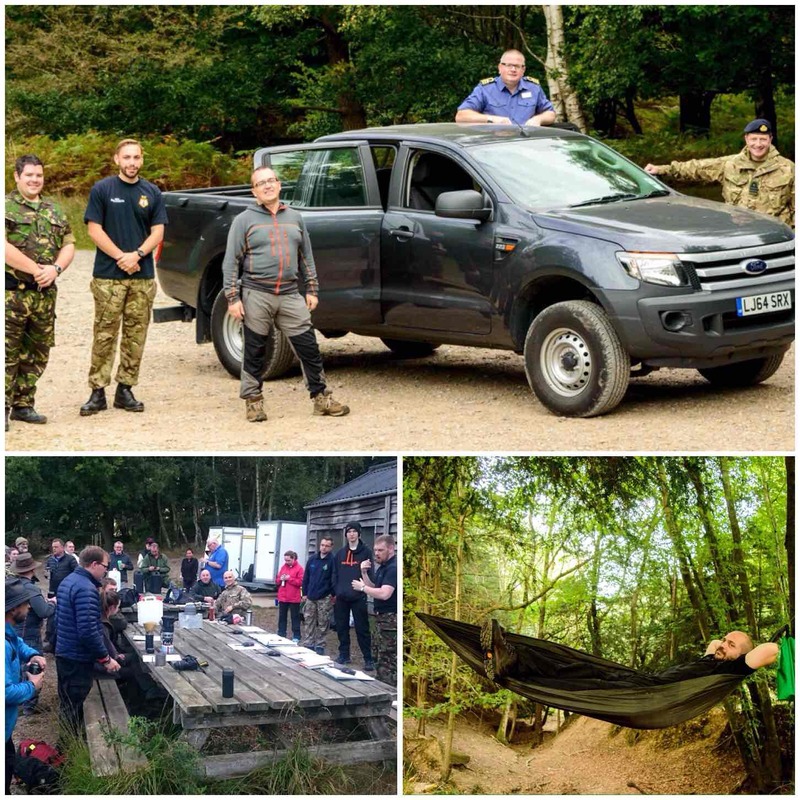 This was set up by our friend Kev Lomas from Southern Area Royal Marines Cadets and he knows how to set a tough race (he knows his stuff as he runs a company called Muscle Acre). After a briefing they were off – each team took about 15 minutes to complete the race. 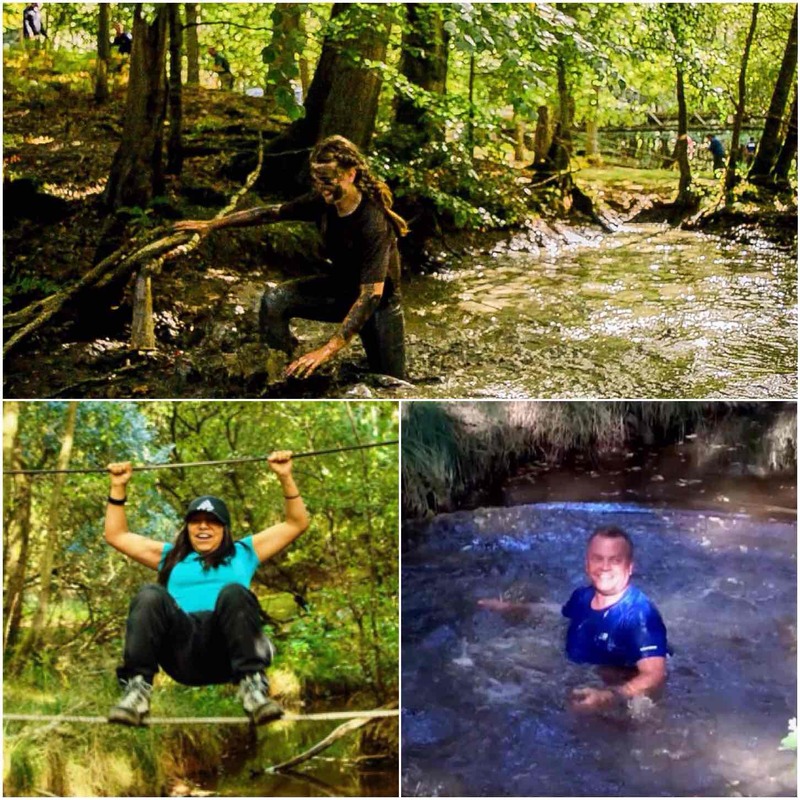 It was a mixture of natural and man-made obstacles but the general theme was mud, ropes and water. It was great to watch the cadets pushing themselves over the race and really come together as individual teams. 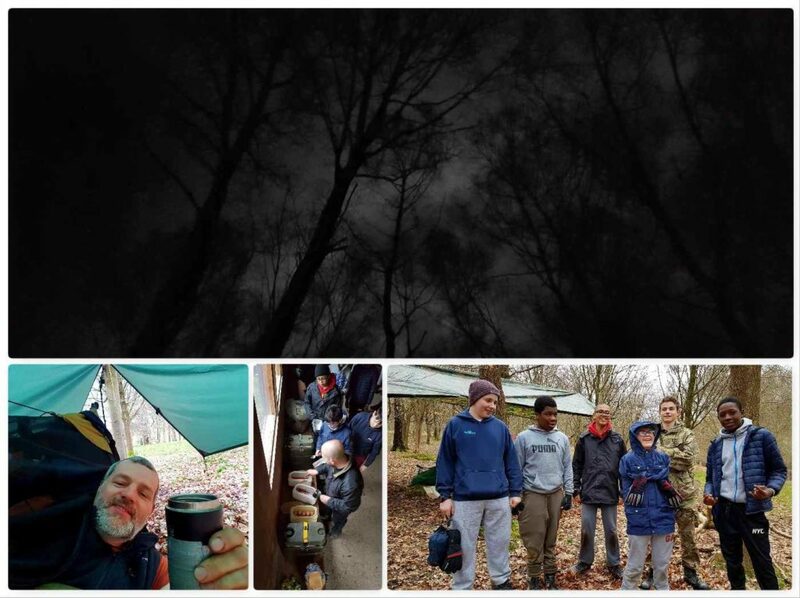 There were staff located all around the site to encourage the cadets and ensure they were always safe. It was hard for them but the looks on their faces when they finished showed that they really enjoyed themselves. 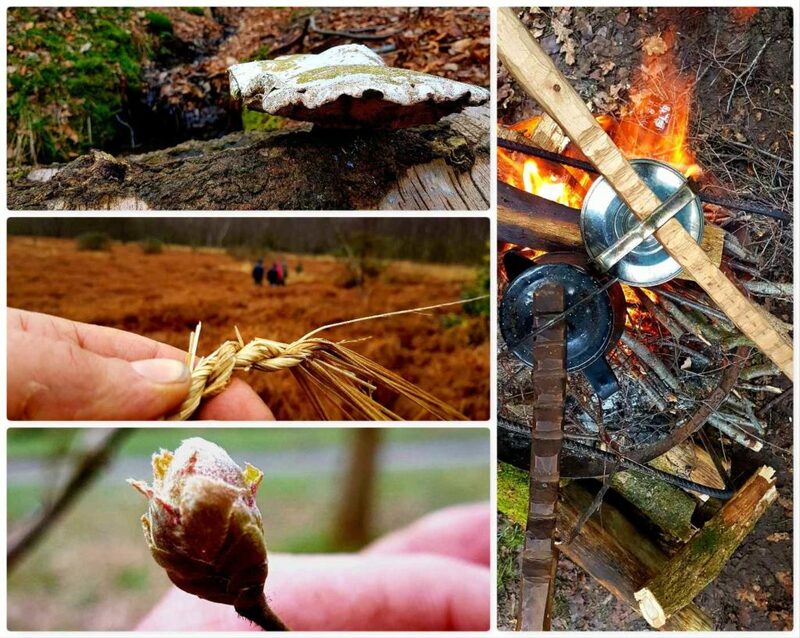 Below is the second of my videos showing the Sunday activities including the Endurance Race. After a quick wash up it was time for the awards. There were 9 teams entered in the event this year and a close run thing it was too. 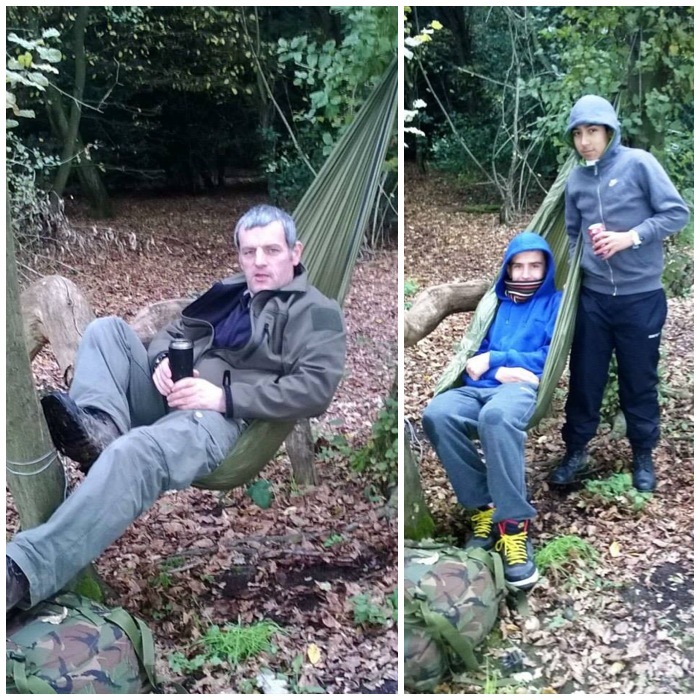 Merton Unit came 3rd, City of London came 2nd and the winners were Maldon Unit – BZ guys. For many years the Chosin Cup has been overseen by our two Area Staff Officers Perry Symes and Graham Brockwell. They are standing down now to make way for some younger members of staff such as Ben MacDonald to take over and test themselves. 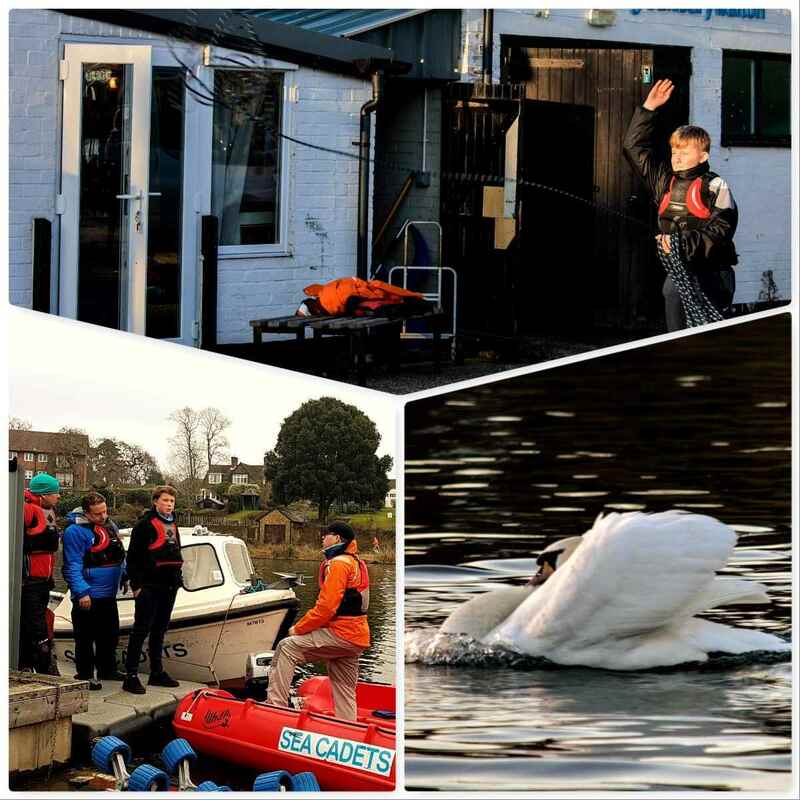 This post then, I am dedicating, (like my videos) to these two stalwarts of the Adventure Training world in the Sea Cadets – Perry and Graham. 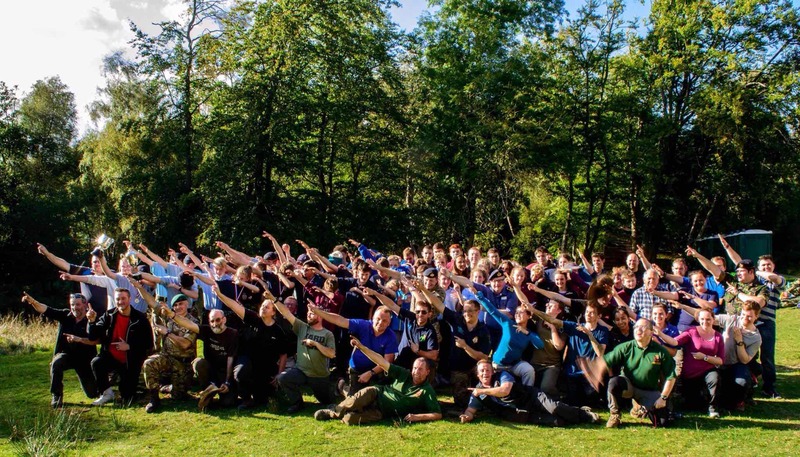 The weekend could not have been run without all the staff that volunteered to come along and run it so thank you to each and every one of you. 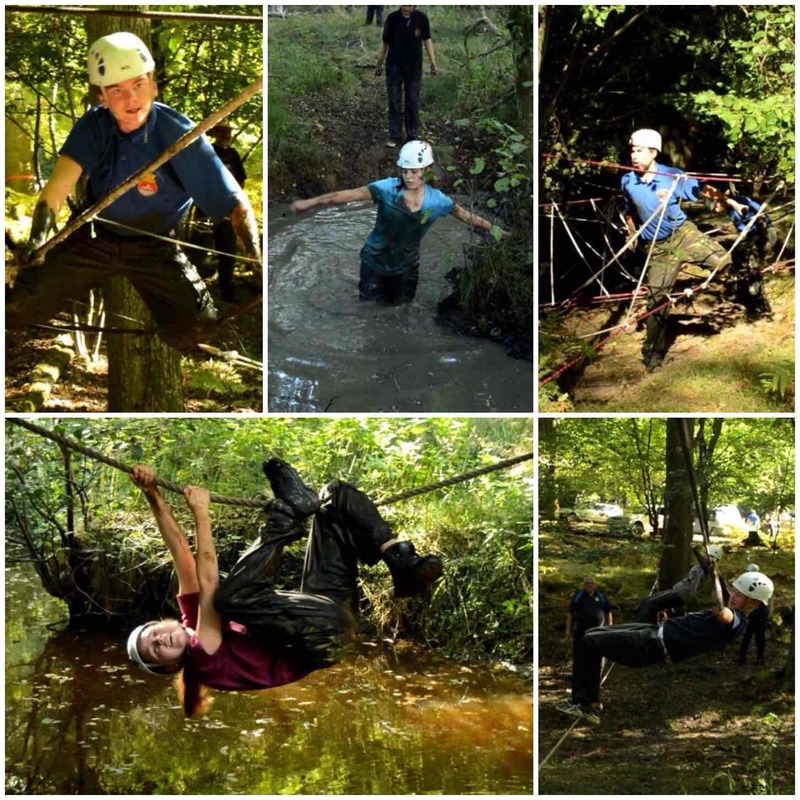 Thanks to all the cadets that came along and really tested themselves in what I regard as the toughest competition the Sea Cadets and the Royal Marines Cadets run. Finally thanks must go to Ben MacDonald for putting it all together and making it a fine one for Perry and Graham to bow out on. 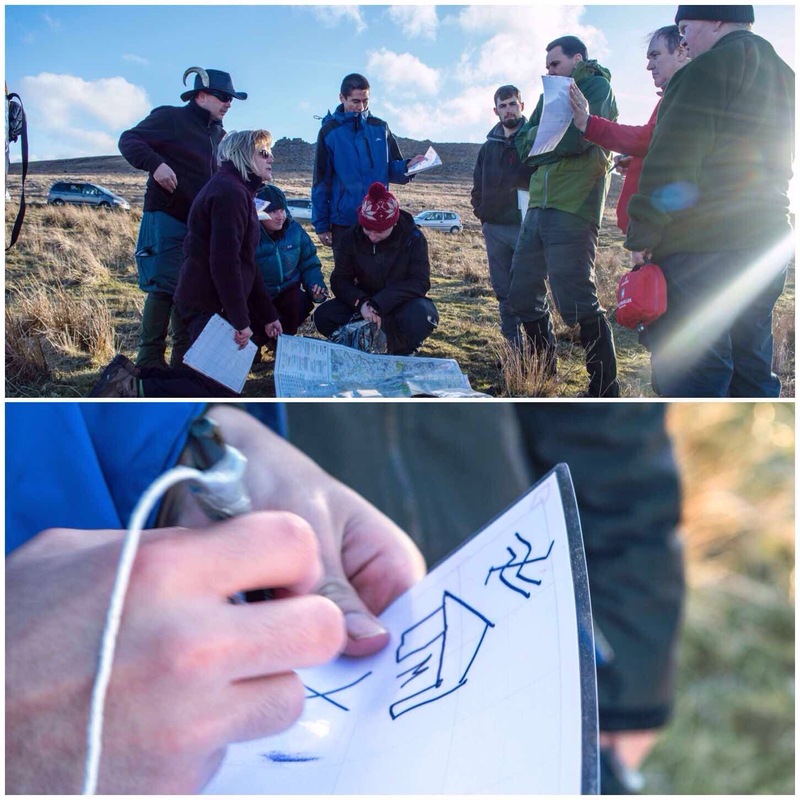 Dartmoor can be a very tough place to learn about the art of navigation but if you can crack it there then most other places will seem like a walk in the park in comparison. 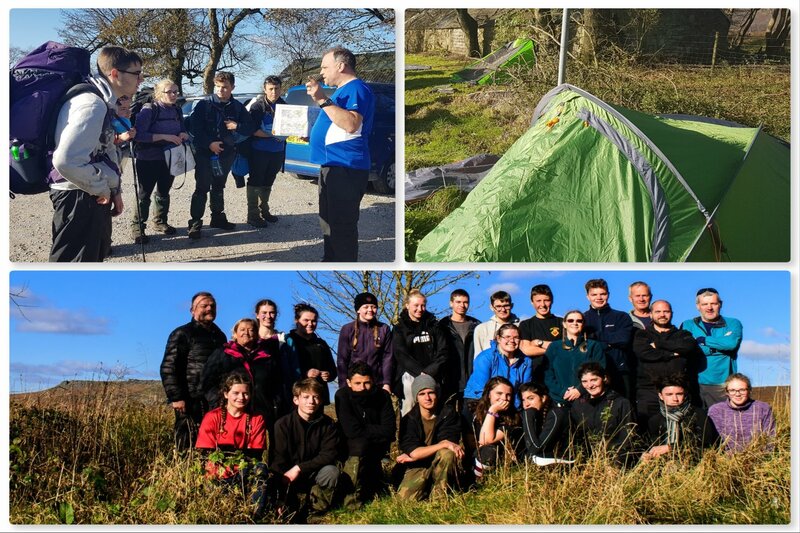 This was the second of four weekends that we are running as part of the Basic Expedition Leader (BEL) award for our Sea Cadet instructors. 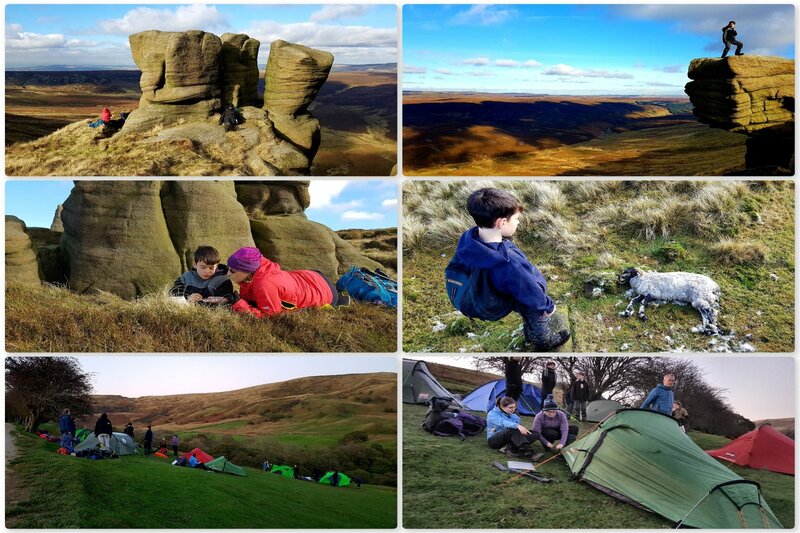 On the Friday night we stayed at Oakhampton Army camp on the northern edge of the moor and then camped out on the Saturday night. 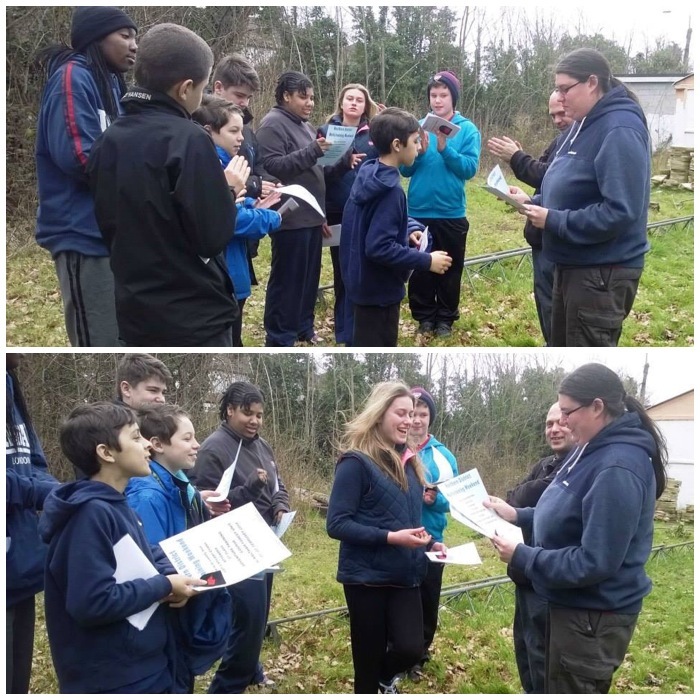 Each student had to give a ten minute presentation on a given outdoor pursuits subject and also a five minute ‘on the hoof’ presentation while out navigating. 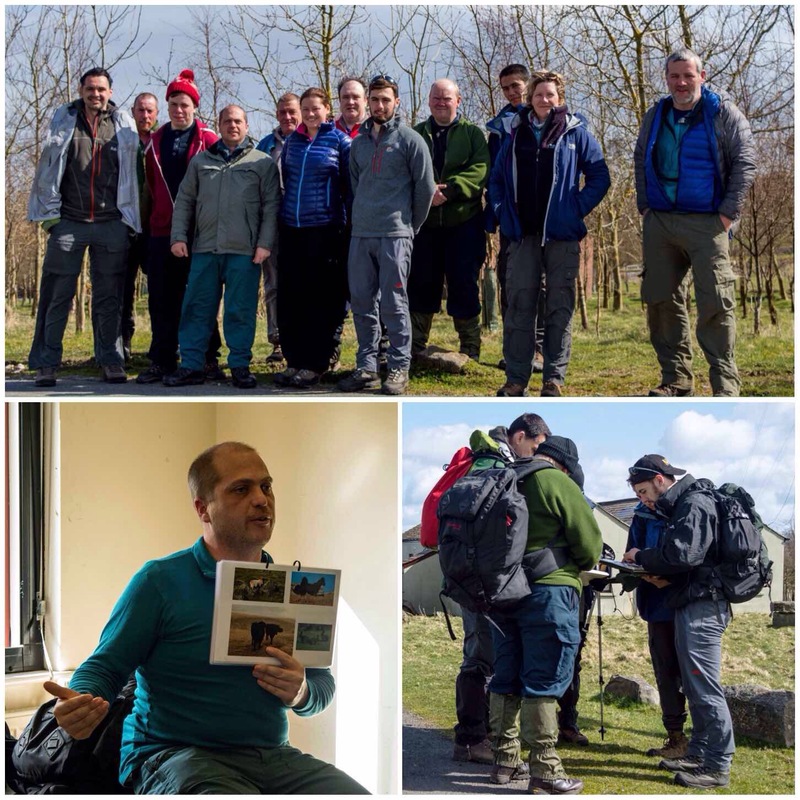 We managed to do a few of the presentations on the Saturday morning before striking out onto the moor. 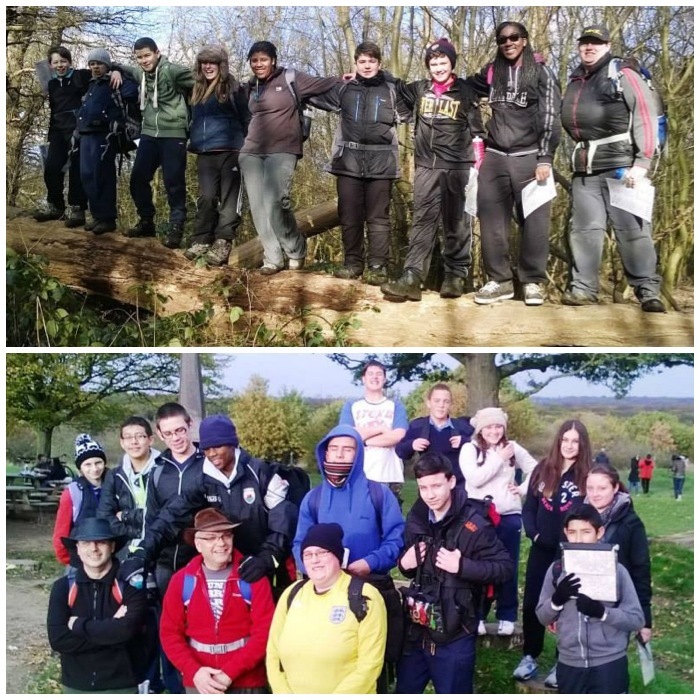 I was working with my good friend Graham Brockwell over the weekend so we split the students into two teams. 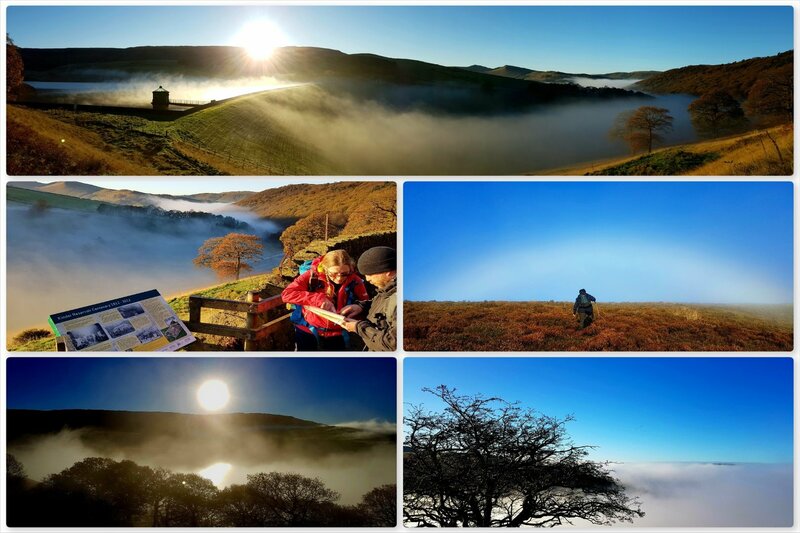 My team headed up onto Yes Tor to work on our map and compass skills. 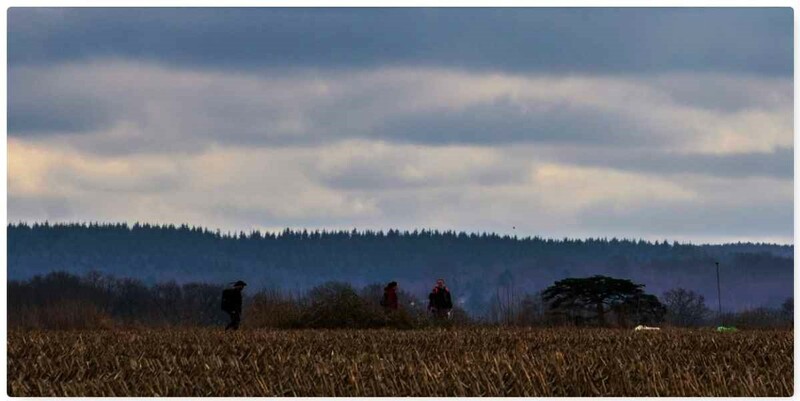 While up there we spotted the local hunt lower down on the moor. While watching them a Royal Navy Rescue helicopter came in below us and landed at Oakhampton Army camp. I always love being up high and seeing aircraft flying about below me. 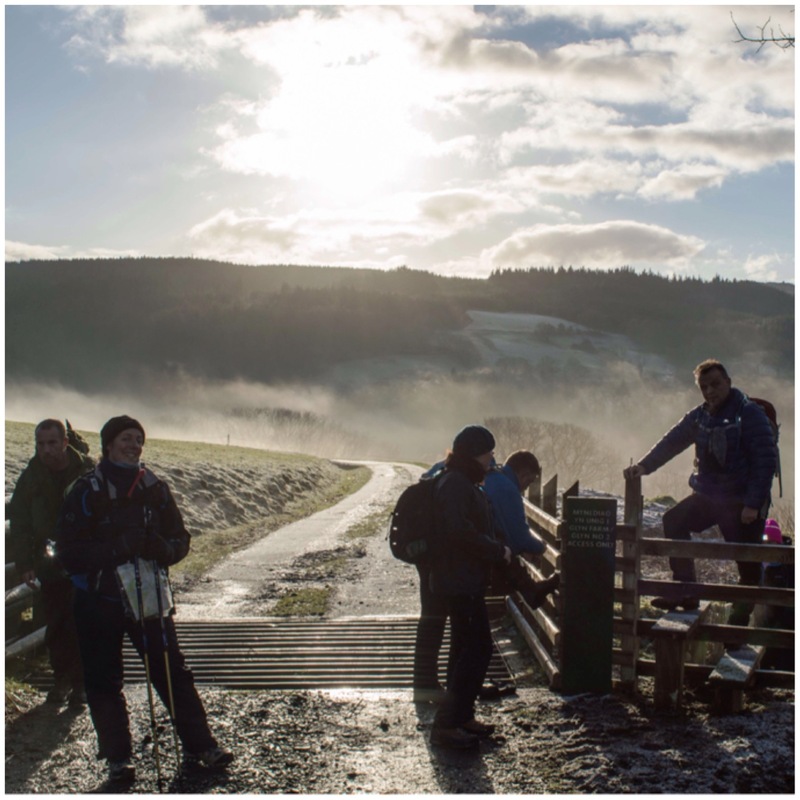 It was soon time to come down of the Tor to navigate along the tracks in the valleys. 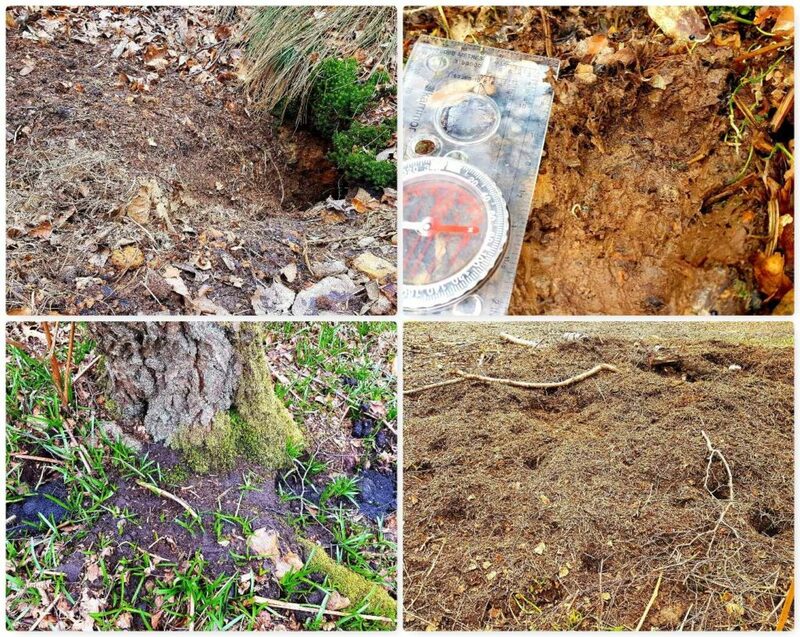 The BEL qualification is a lowland award and the students have to show a high degree of accuracy while navigating on clearly marked paths. 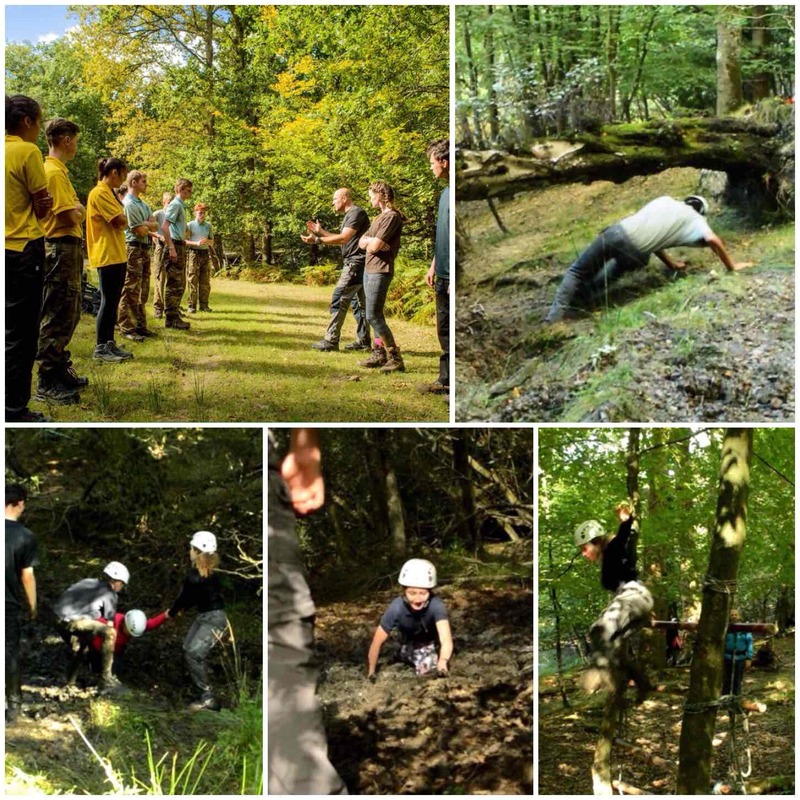 After a few more presentations we found the old artillery range. The metal rails you can see in the picture on the bottom left were for the carriage that held a large target for the artillery to shoot at. 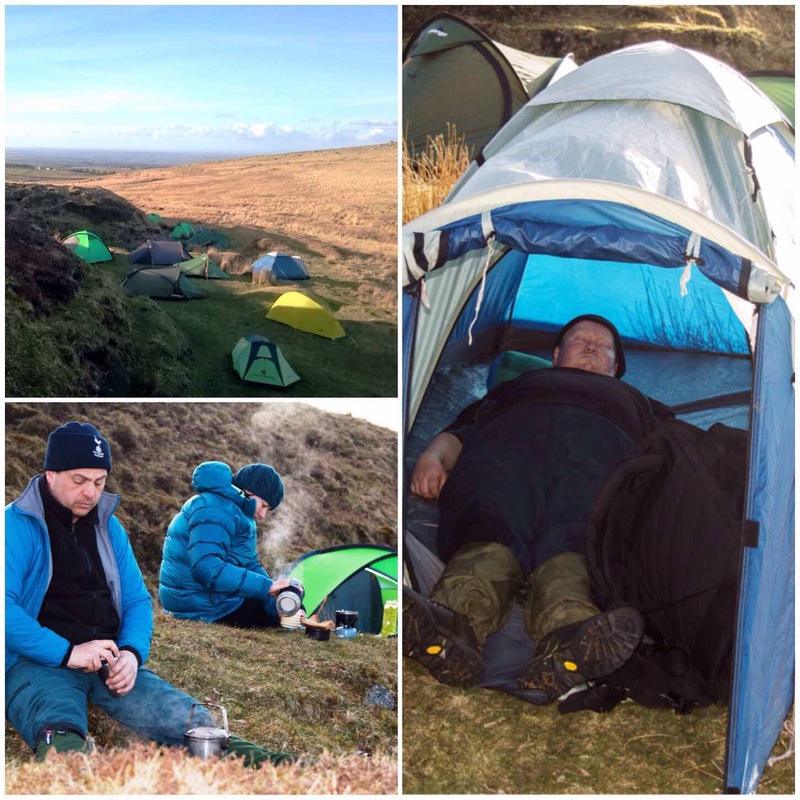 Camp on the Saturday night was quite high up but very near to a road where we had our minibus parked. The last of the presentations were run that evening. It was still very bright but very windy. In this class Carol was doing a quiz on map symbols that involved a little artistic licence. 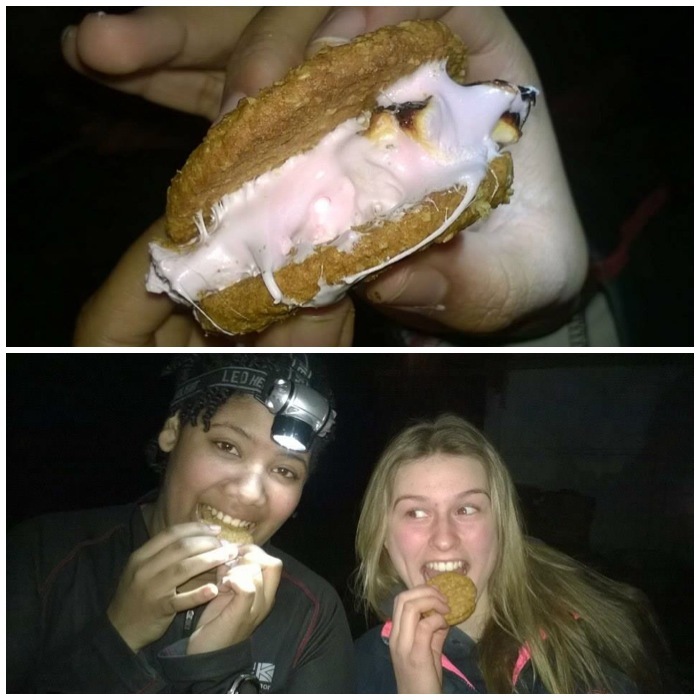 Once it got dark Graham and myself took everyone on a hike without torches onto one of the Tors. The skies were very clear and as everyone’s eyesight had adjusted to the dark the views of the stars were exceptional. There was a slight level of light pollution around the edges of Dartmoor but looking straight up was crystal clear. 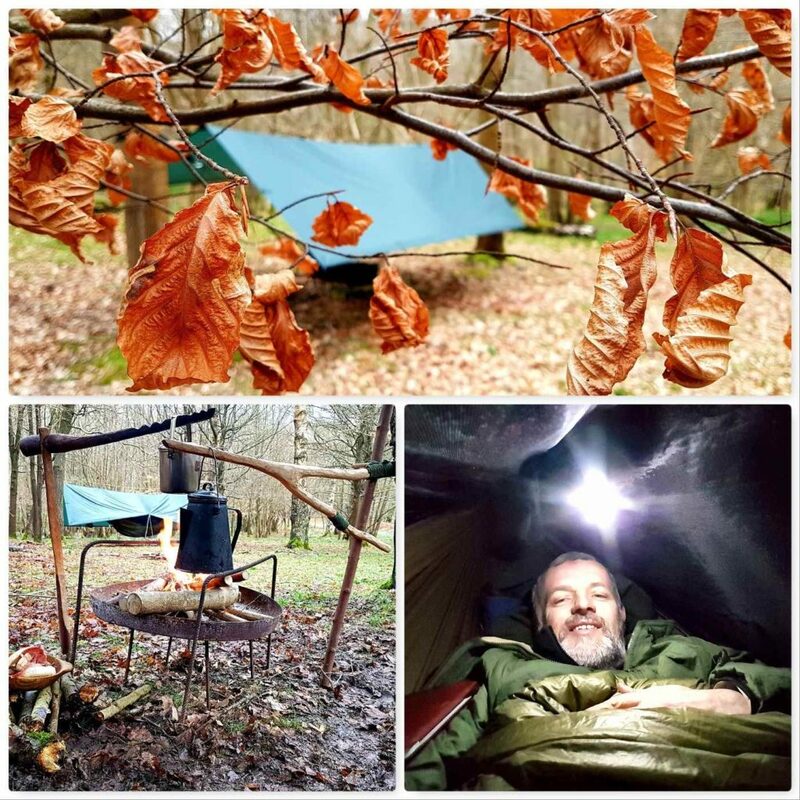 This weekend I had to sleep in a tent (contemplated the hammock stand but it was just a tad too windy) but it was surprisingly comfy I have to admit – the two roll mats helped!! 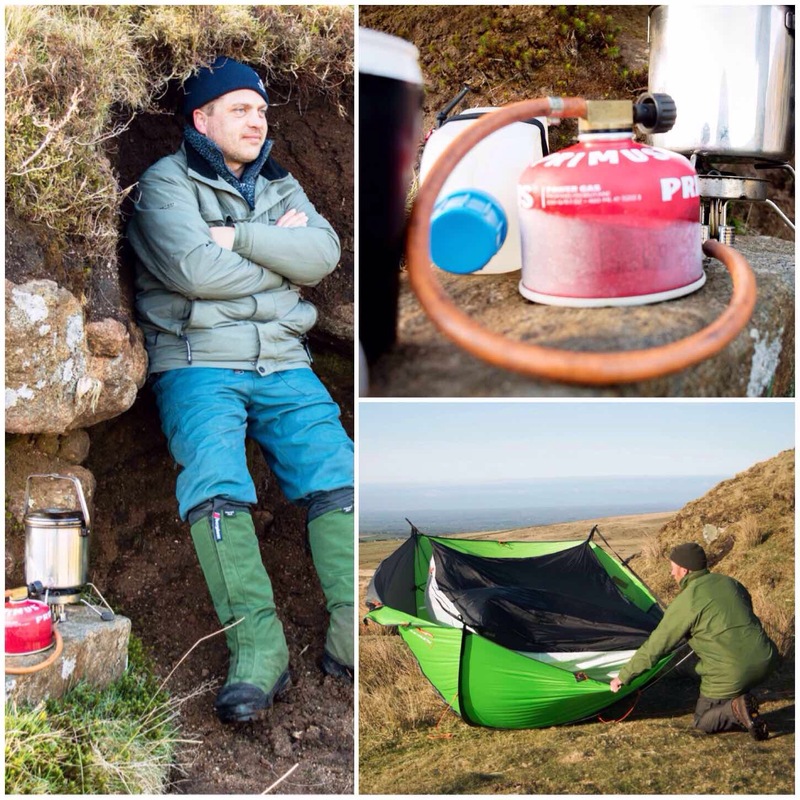 Cooking on the moor can be difficult with the wind but Dave soon found himself the perfect niche to get out of the wind to brew up. 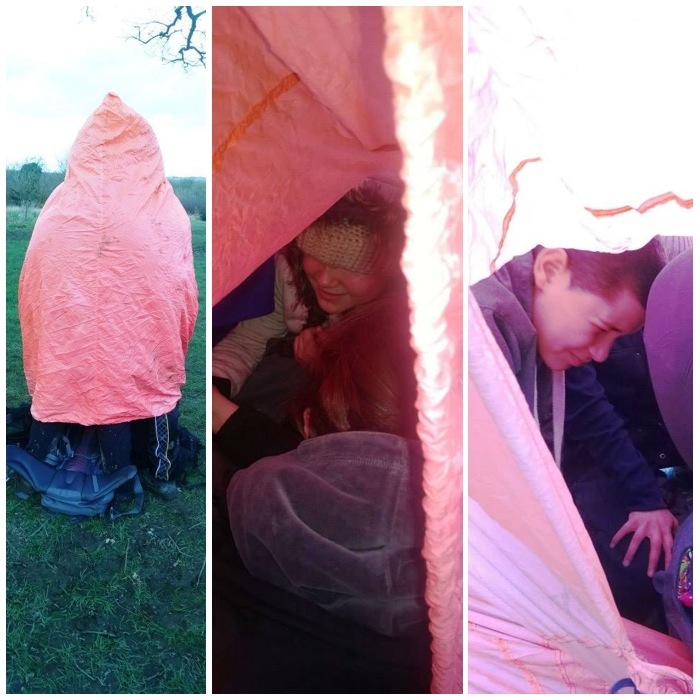 The wind was really helpful though with drying the tents off quickly. It was just the undersides that needed drying so as long as you held on tightly to it, it was soon dry. Now Graham managed this on his own as he is a bit of a pro however some of the student instructors (I did say some) needed to get a bit of teamwork going to get everything packed away without being blown away. The Sunday morning was to be a short affair as we had a long drive back towards London. 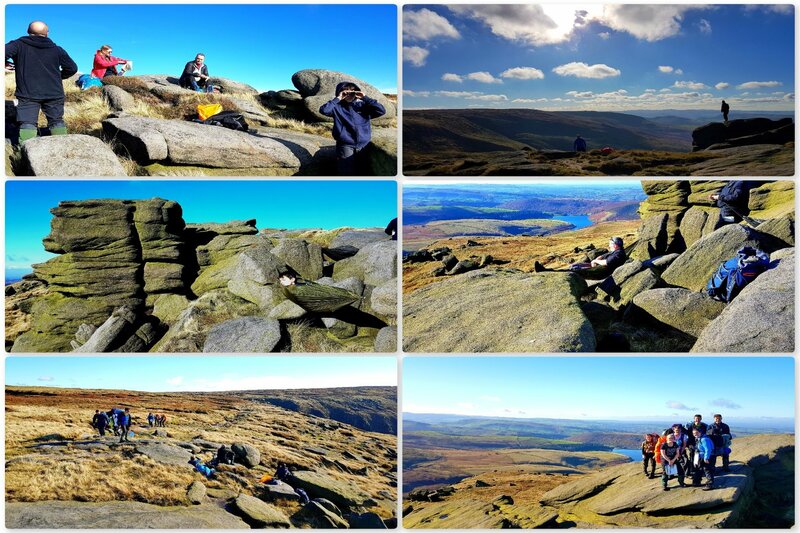 It was still a bit windy but brilliantly clear making the navigation slightly easier. To begin with we did some compass work and were soon off. 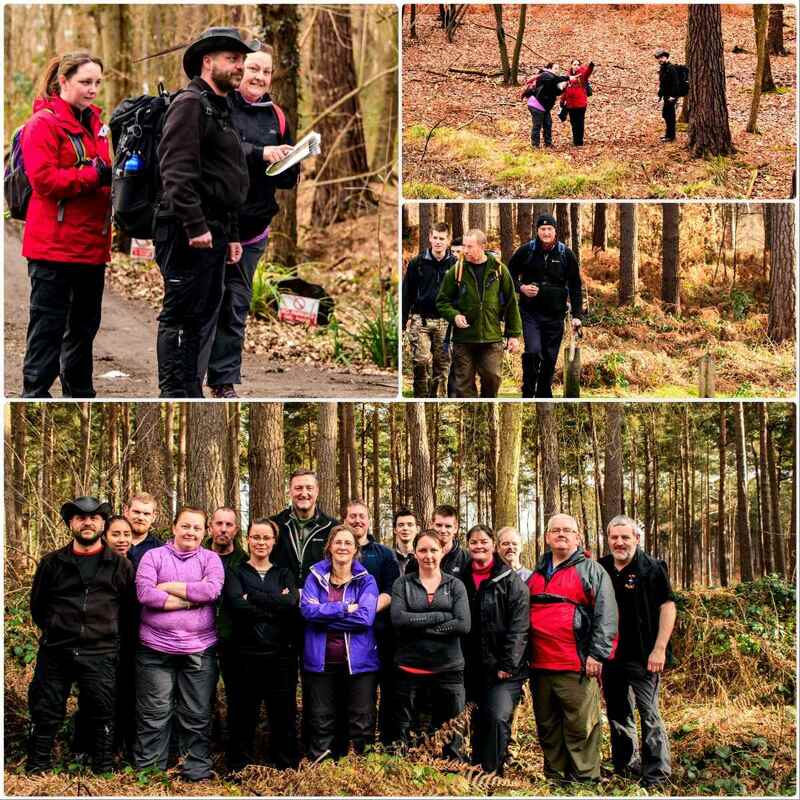 Along the way it was time to run a scenario – a first aid scenario. It is quite common for someone to trip on the moor and pull a muscle or twist an ankle. I asked Jack to quickly lie down, set the scene for the students and set them to it. 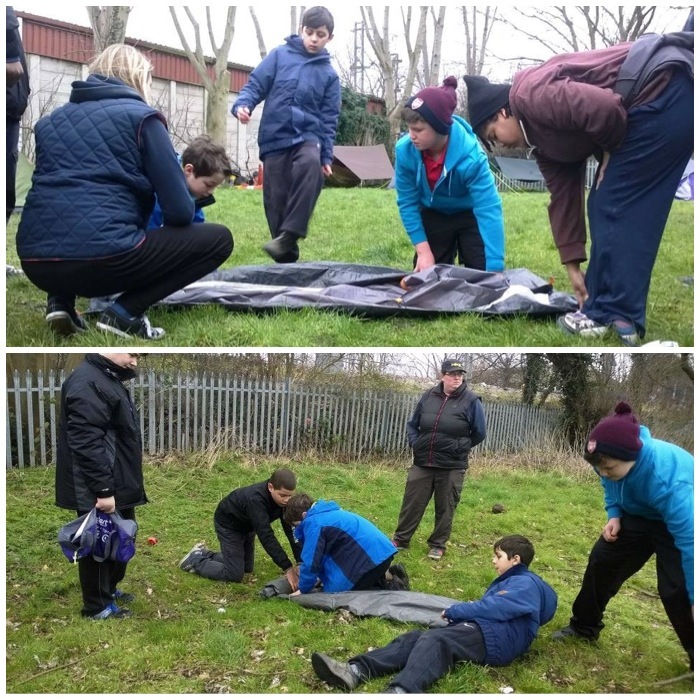 The scenario was that Jack had hurt his leg, bad enough to find it very difficult to walk but not a broken bone. 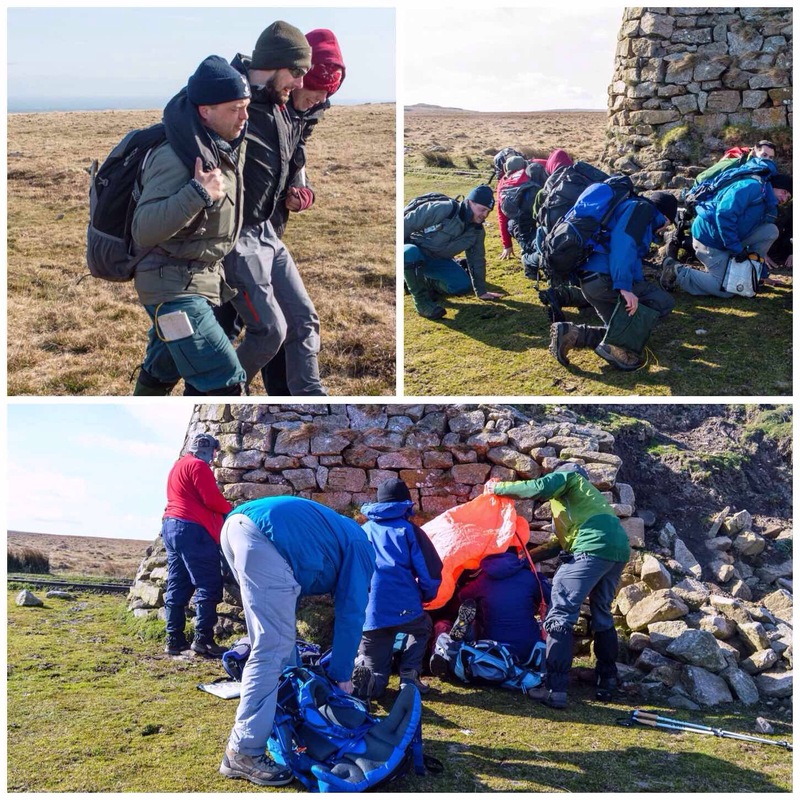 The students were briefed that the minibus was nearby (it was) and that as they had enough people in the team they could treat Jacks injuries and rig a seat to carry him out. Jack was helped over to the side of a collapsed building for shelter to be treated to get him out of the strong wind. In the picture above you can see the students placing their hands on the ground. This was to show them how cold the ground gets very quickly and the importance of protecting Jack from the cold ground. 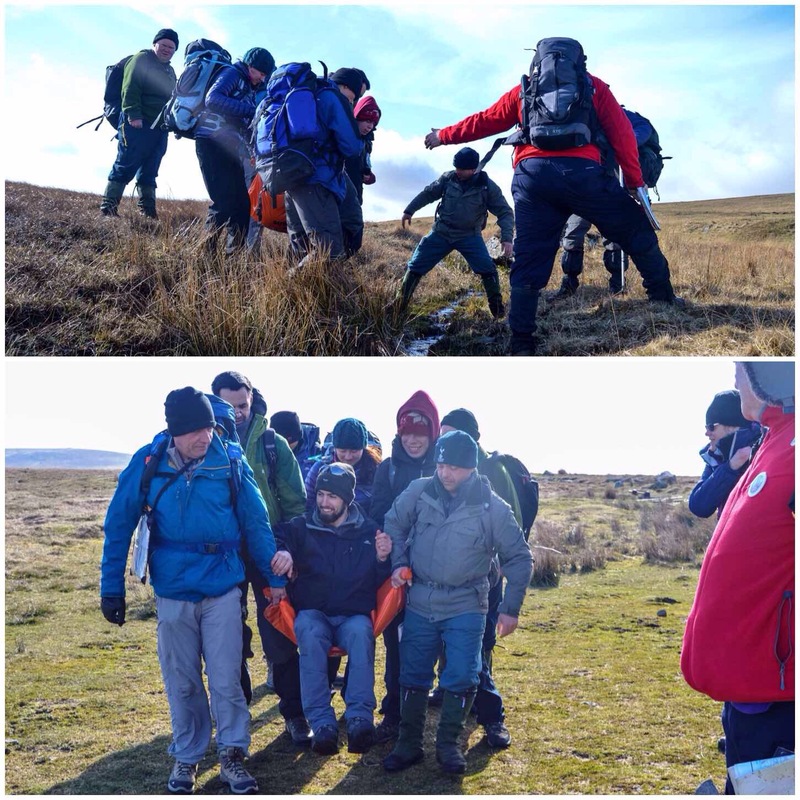 Once he was comfy a seat was rigged from a survival bag and slowly (everyone taking turns) Jack was transported about 100 metres or so off the moor. 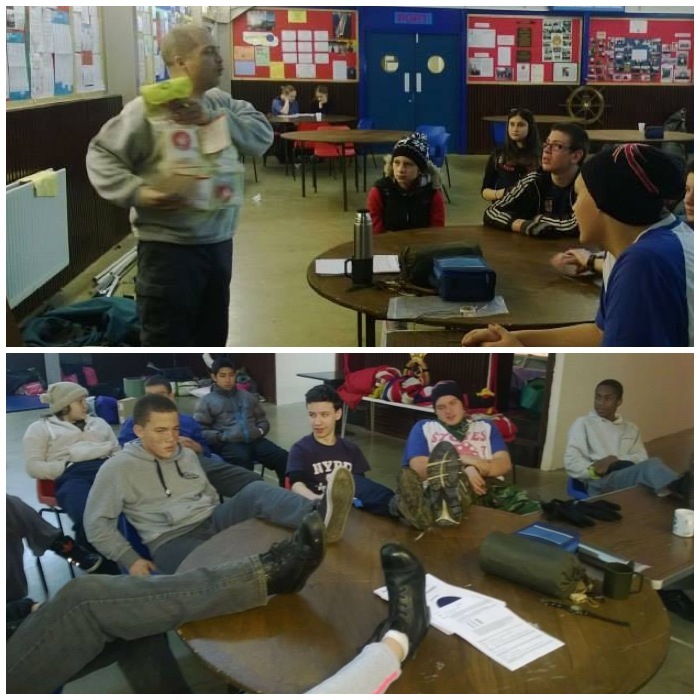 Dave got his bothy bag out for some of the guys who had never used one before to try out. 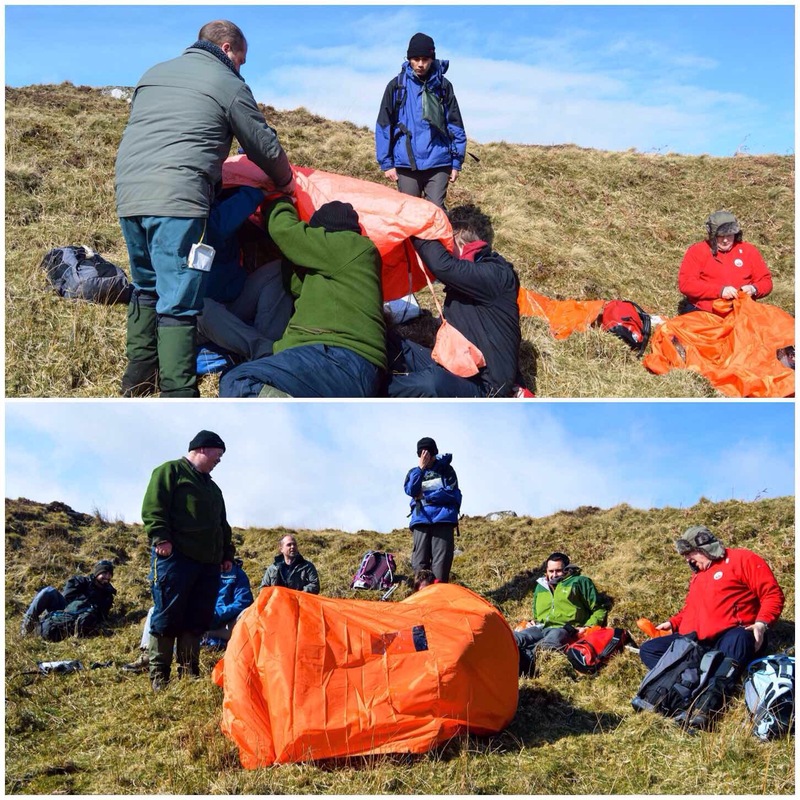 This bit of kit is brilliant in an emergency to treat a casualty out of the wind or more commonly as a mobile shelter to each your lunch out of the wind. 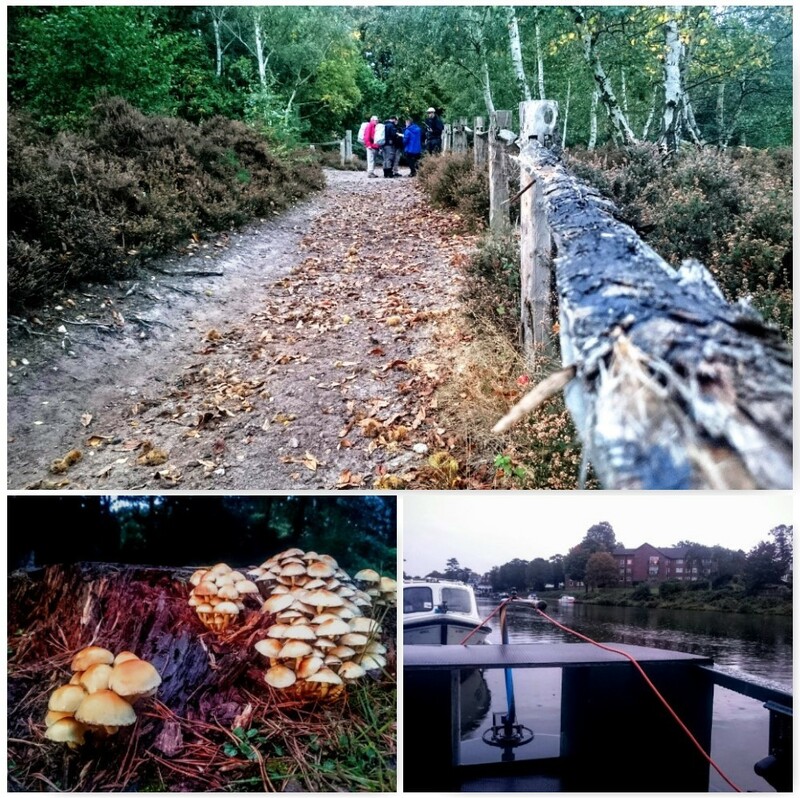 To finish some of us jumped into the minibus back to the camp while others enjoyed a nice walk down off the moor. 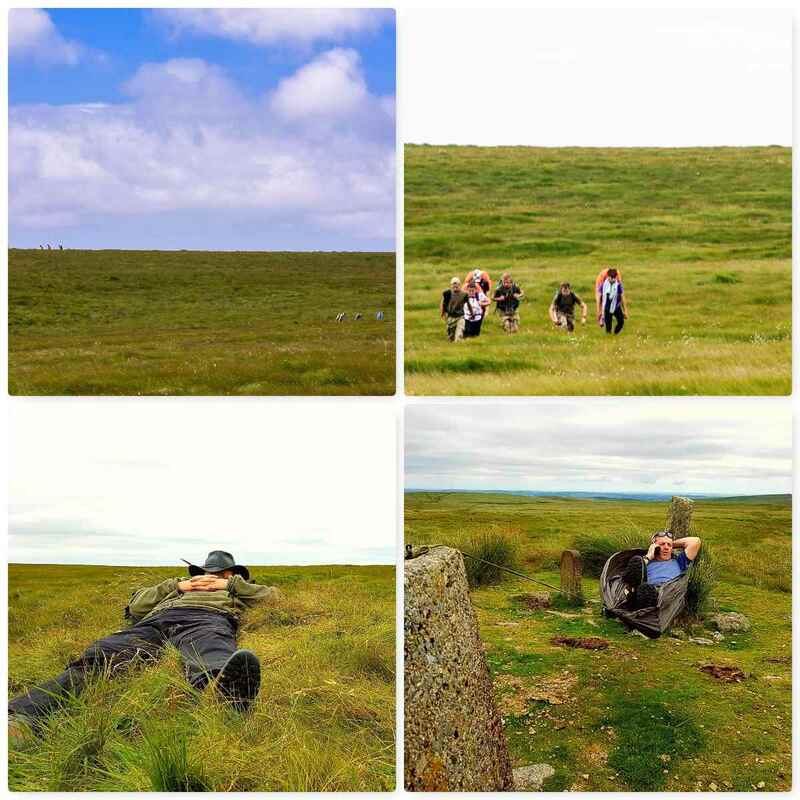 The whole weekend on Dartmoor was lovely in terms of the weather and the traffic on the A303 on the trip home ran really smooth – not often you can say that. 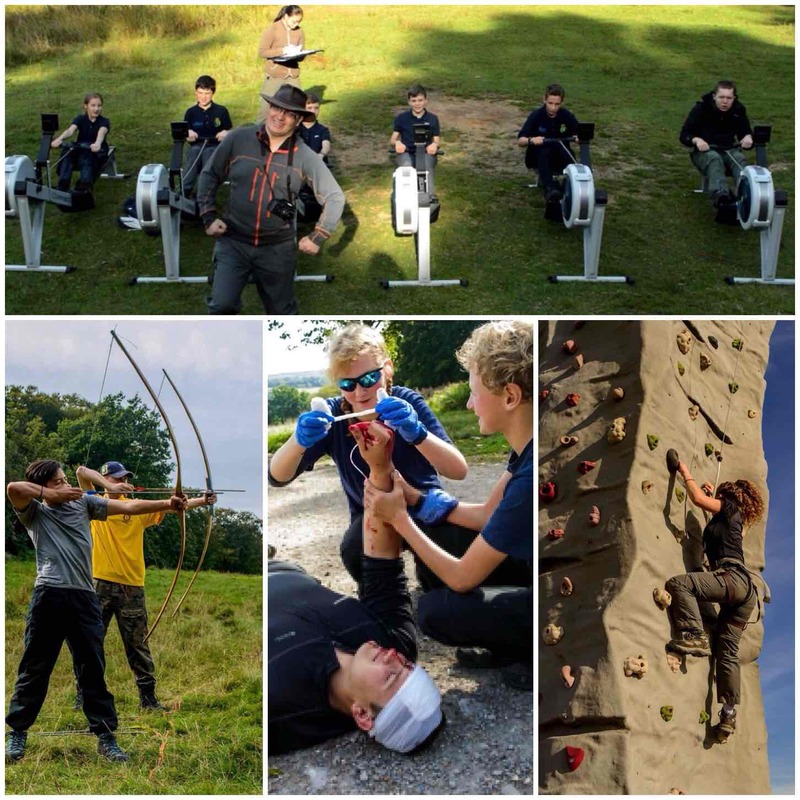 January is usually the time that as outdoor pursuits instructors in the Sea Cadets we venture up into the mountains and moors to do a bit of skills training. 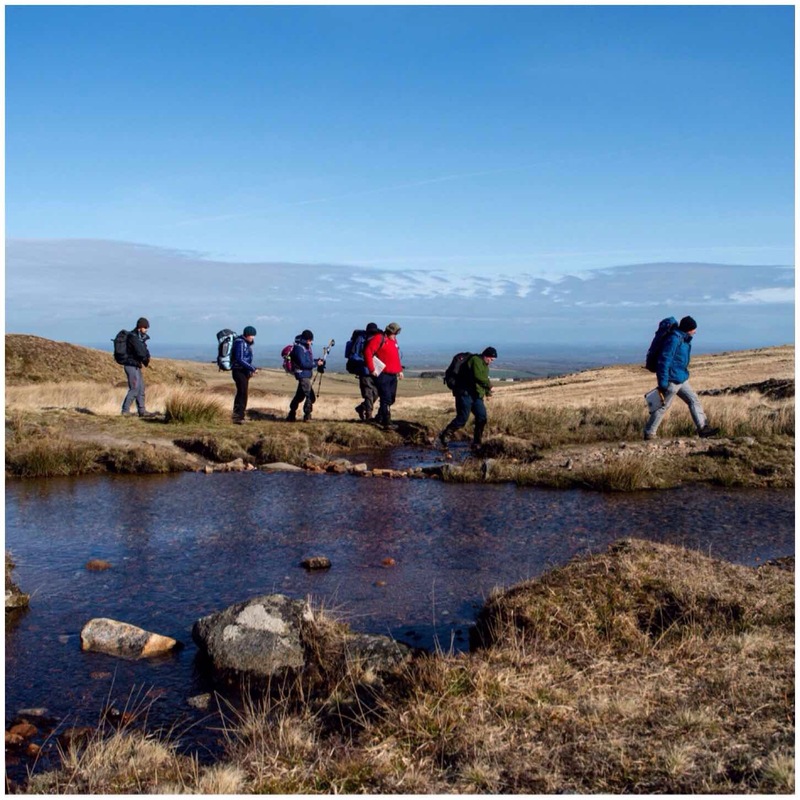 This is just not as a bit of extra training for ourselves but as a way of introducing some of the newer instructors to the world of hillwalking and mountaineering. 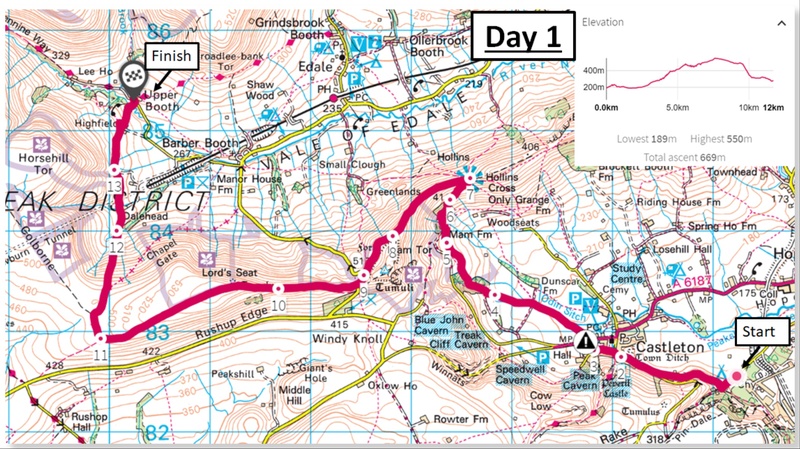 This year we went to Snowdonia National Park where we walked and scrambled around Mt Snowdon and stayed at Capel Curig Training Camp. There was a smattering of snow on the mountains when we arrived but not a great deal. The winds had been very high in the few days leading up to our weekend and had blown most of it away. 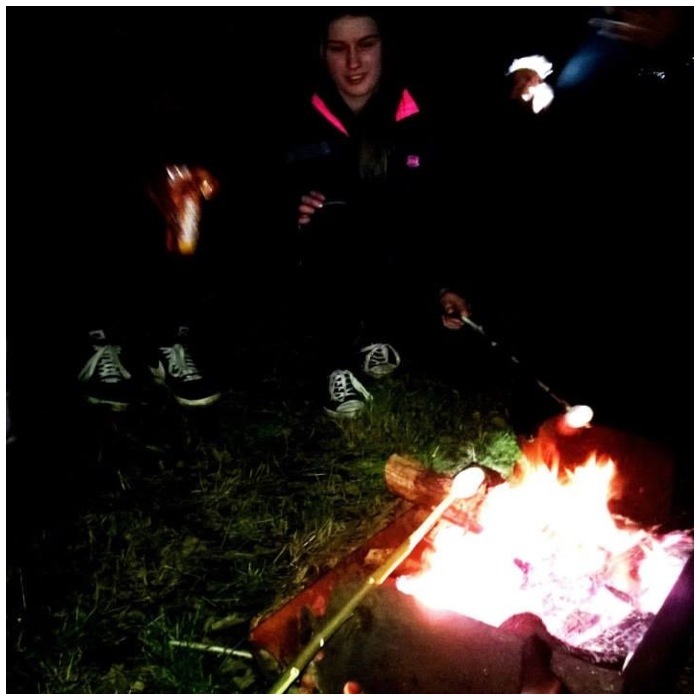 The weekend was organised in quite a relaxed manner. 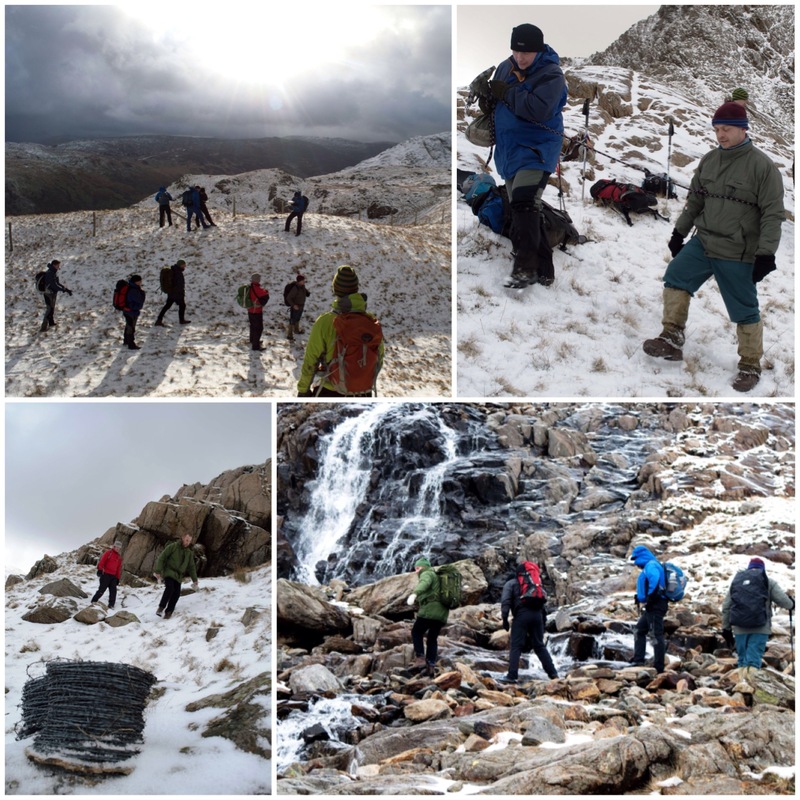 One group decided to walk over Moel Siabod and the surrounding area while the group I was with decided to do a bit of scrambling and winter skills around the base of Mt Snowdon. 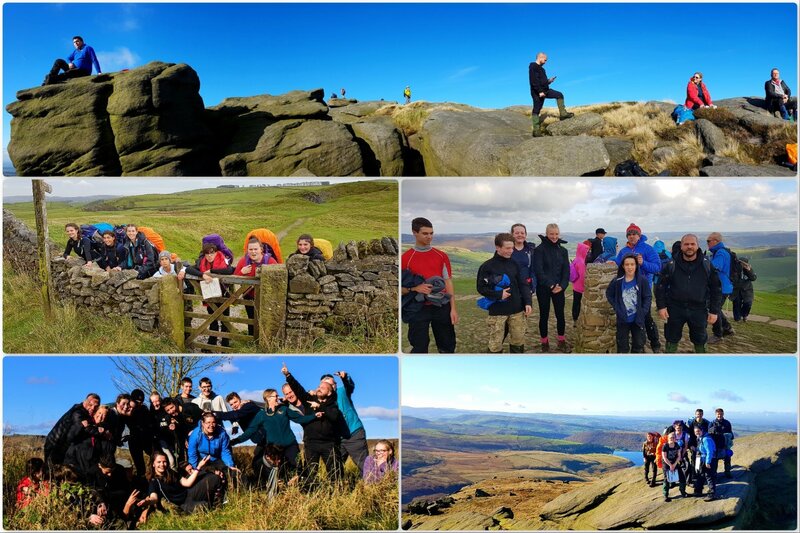 We had arranged to meet up with some non-Sea Cadet friends that day who were also training in the area and set off early on Saturday. 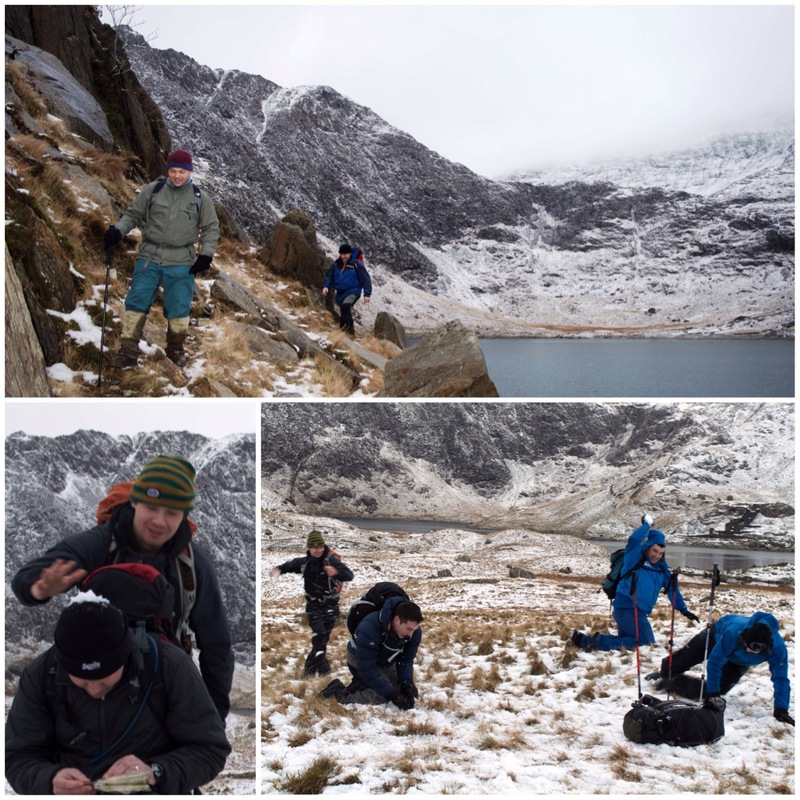 We were not aiming to summit that day but concentrated on working on our micro-navigation skills, leadership and group management. 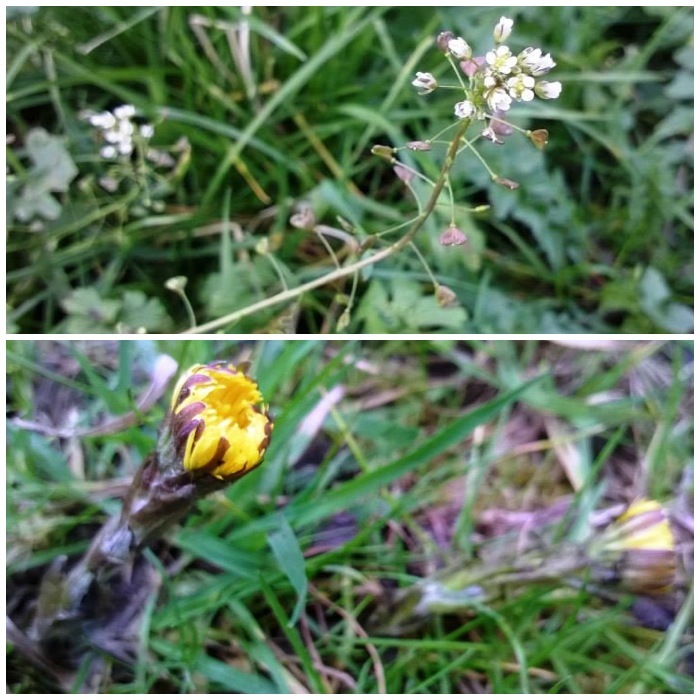 For me, it was also a good opportunity to practise my photography skills. 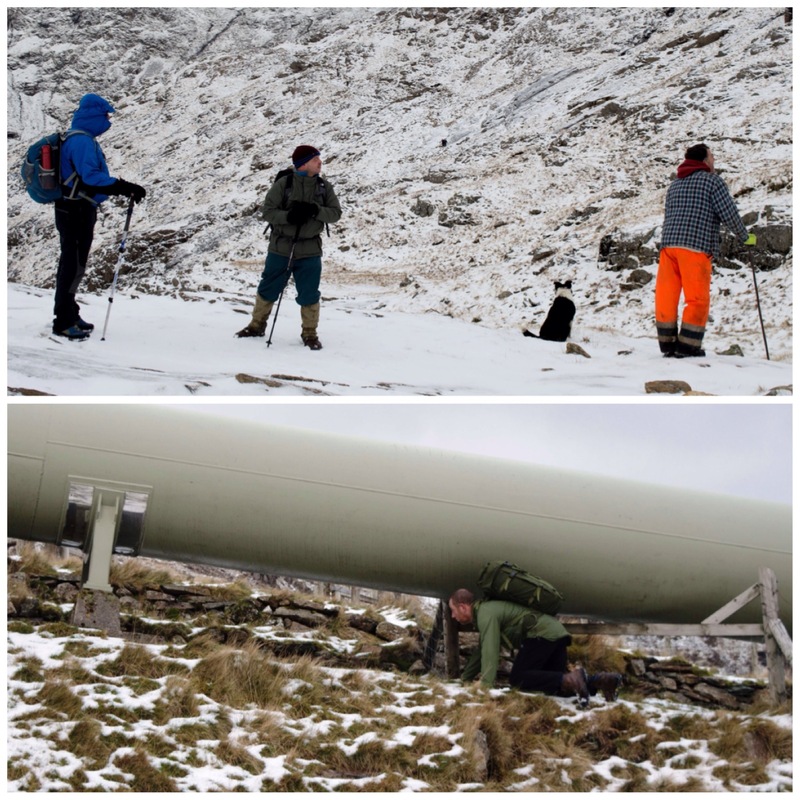 I have a separate post on these pictures in this post on Special Snowdon Scenes. 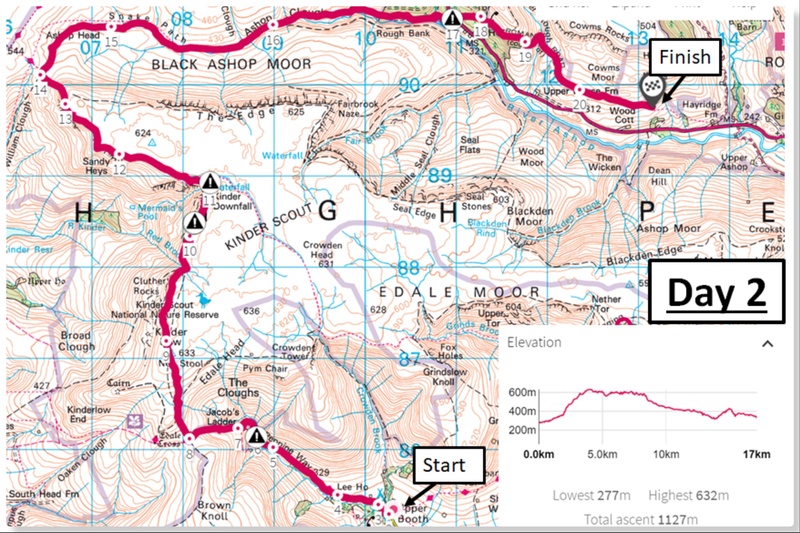 Our route took us from the car park at Pen Y Pas, up over The Horns, below Crib Goch, up to Glasly, around the southern shore of Llyn Llydaw before heading back to Pen Y Pass via Cwn Dyli. 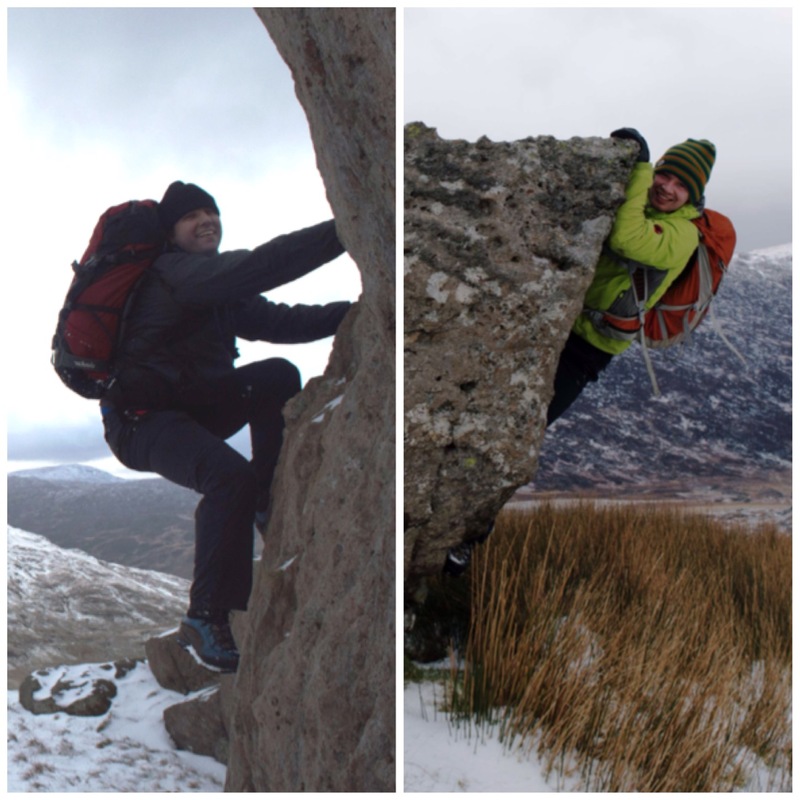 While we were ascending up to The Horns and then onto the base of Crib Goch some of the lads took the opportunity to get a bit of bouldering in. The weather was cold but clear, making it ideal for keeping what little snow we had and perfect for photography as well. We got some good views as we worked on taking bearings on near and far features so as to double check our positions. 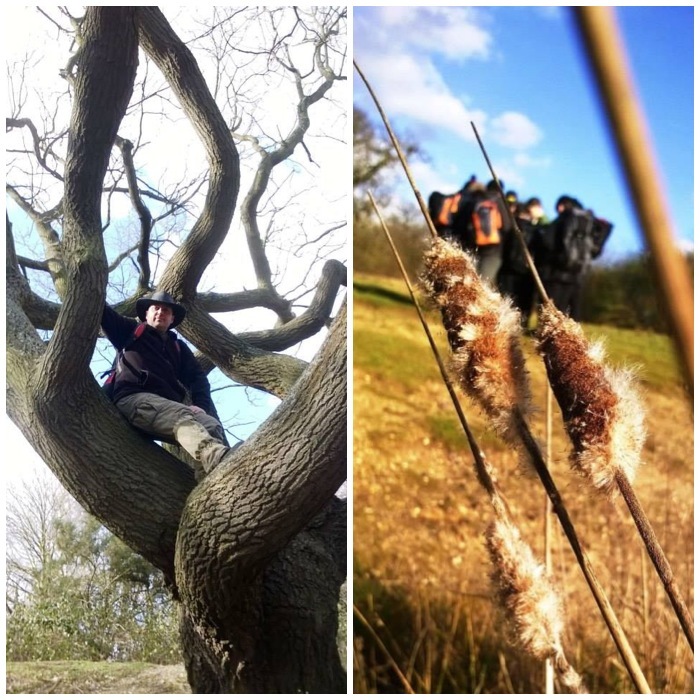 Also we spent some time working on rope skills, learning to ‘dog lead’ a nervous student over tricky terrain. 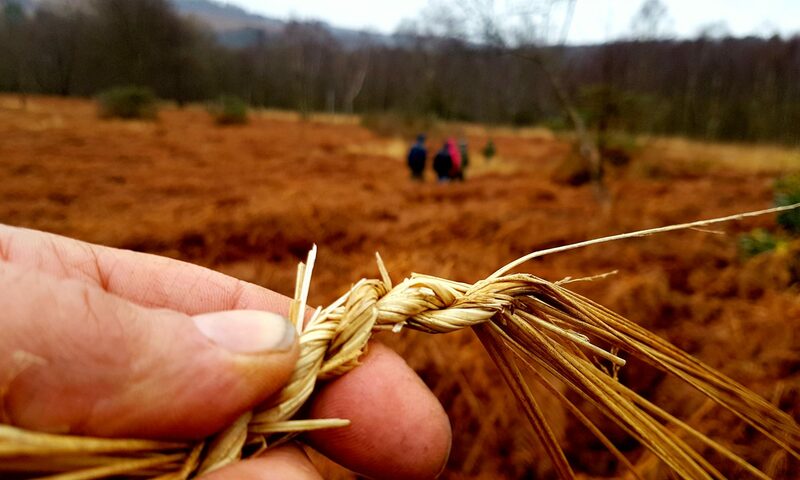 Route finding is always a good skill to practise, whether that is to avoid great big coils of barbed wire or picking your way across a stream. While we were wandering around having a good time a shepherd and his collie dog came by. As soon as the shepherd stopped the collie sat perfectly still. They both looked around, scanned the mountainside and then were away. In a couple of minutes both the shepherd and collie had disappeared. This moment reminded me that our playground is also someone else’s workplace. We had hoped to scramble up Cribau but decided against it as there was a lot of ice at the top. 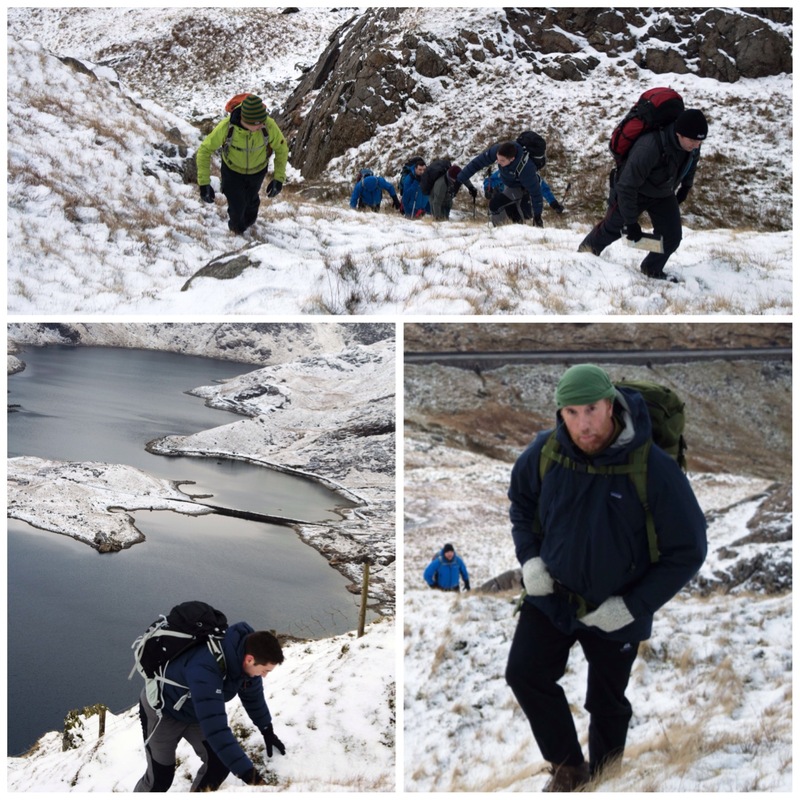 Not everyone had crampons or ice axes so we decided to head down to Llyn Llydaw instead. 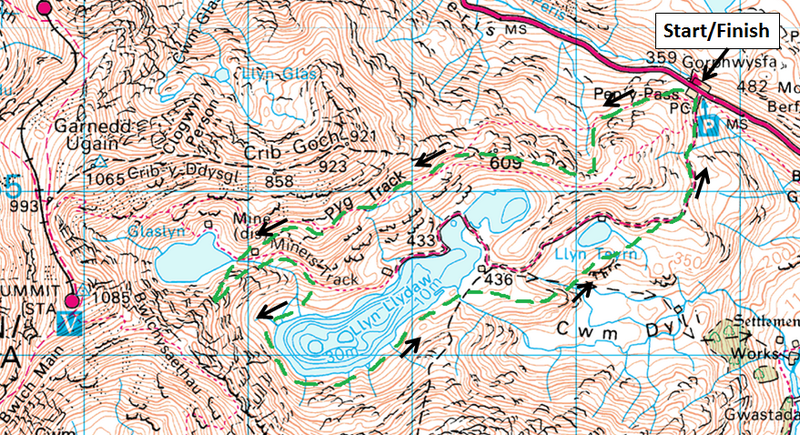 We walked around the southern shore of Llyn Llydaw to get off the beaten track and concentrated on micro navigation. 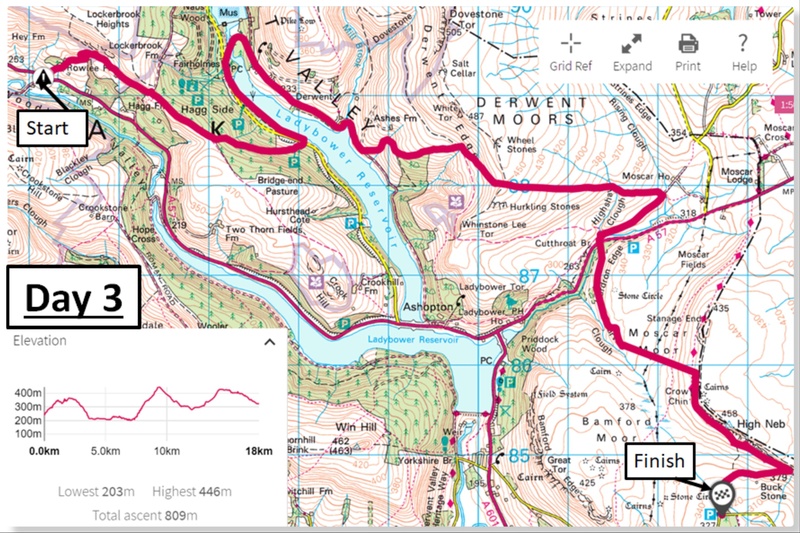 The route is not obvious but well worth the effort. 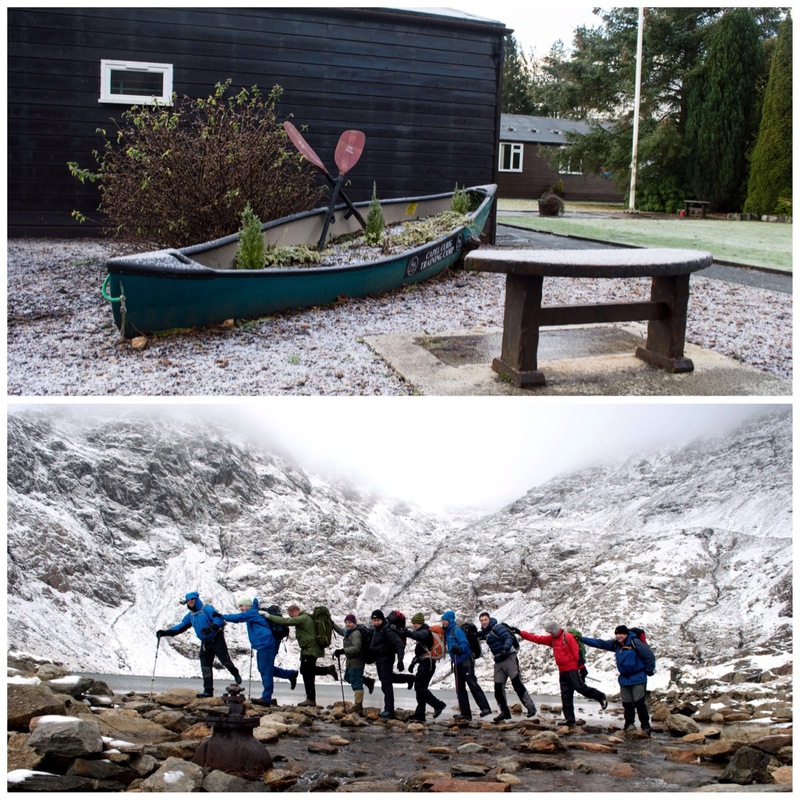 When we reached Cwn Dyli it was time for a snowball fight. Needless to say no prisoners were taken. We all decided to stay down low on the Sunday morning. 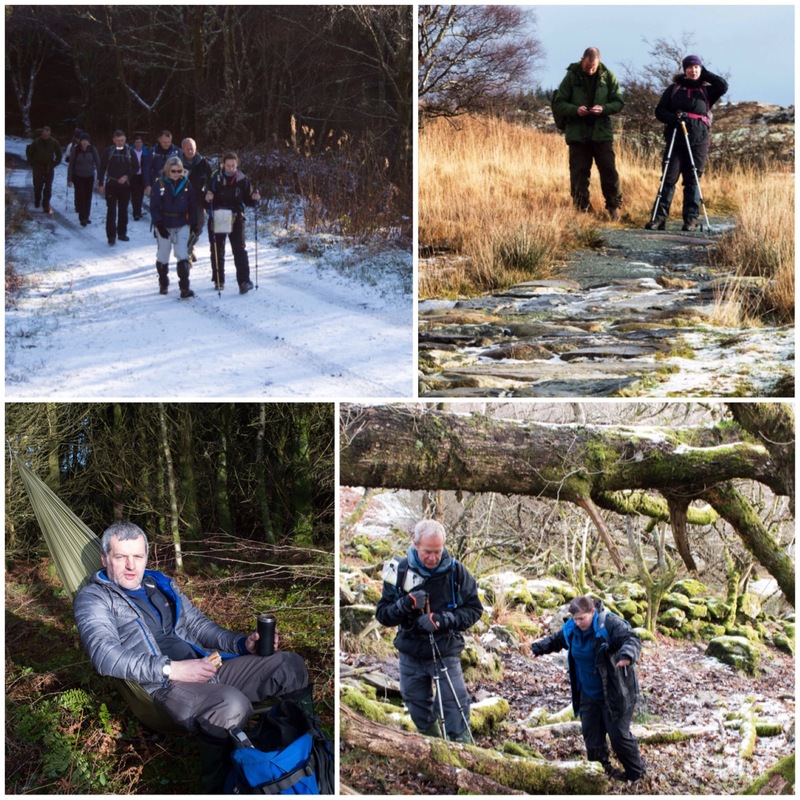 Some of the guys went to the Pinnacles to do a bit of rock climbing and the rest of us walked from Capel Curig Training Camp up to the cafe in Capel Curig. 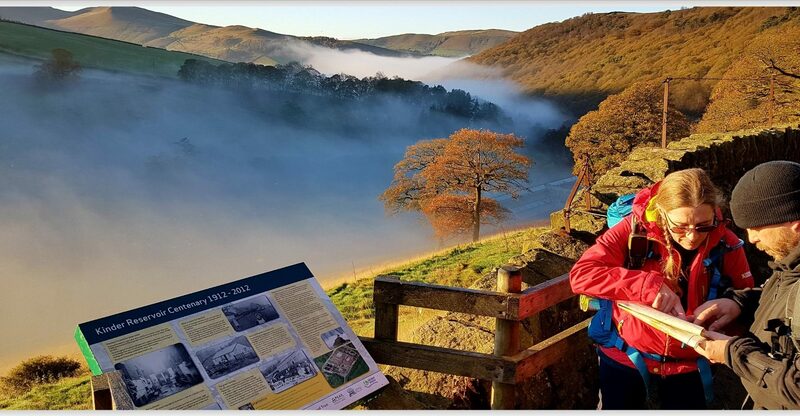 It was a stunning morning with low-lying mist and beautiful sunshine. 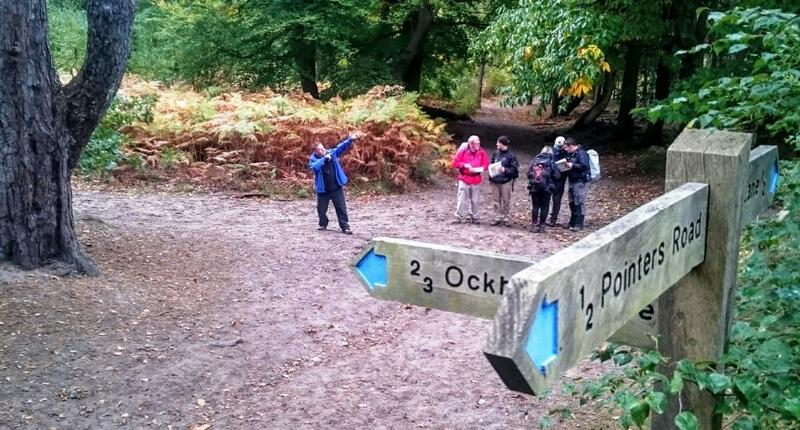 We did a little bit of navigation but to tell you the truth we mainly just enjoyed the walk. It got a bit muddy in places but we just took our time. 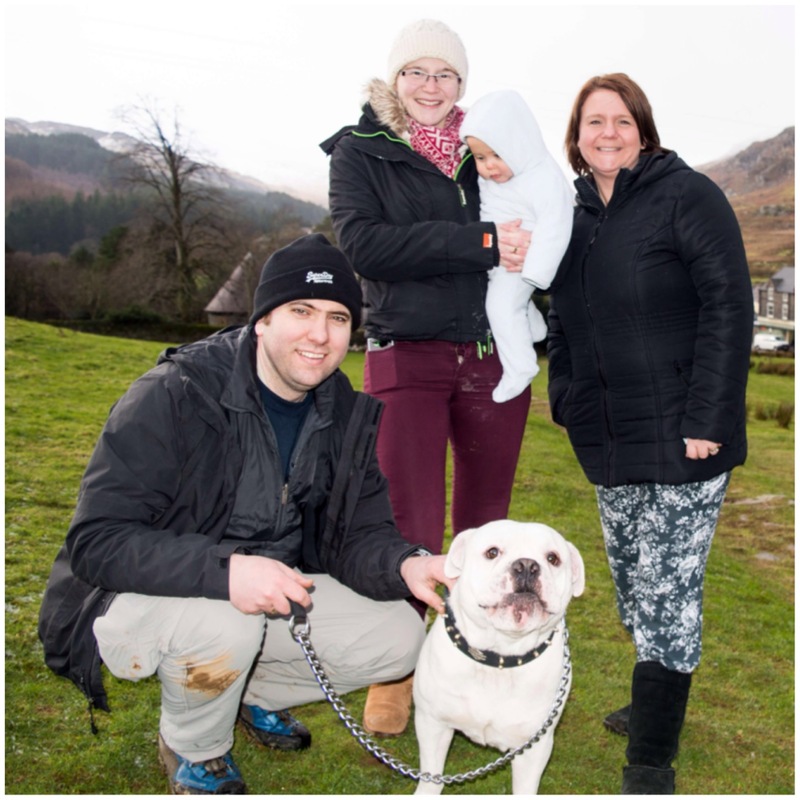 Just before we reached the cafe at Capel Curig I met up with Dan Keefe and his lovely family. They had all come up for the weekend and were staying at Llanrwst to celebrate Dan’s birthday. This was also the first time I had met Dan’s little lad Oscar. The rain came in just after I took this picture so it was time to get a bit of lunch before heading off home in the minibus.